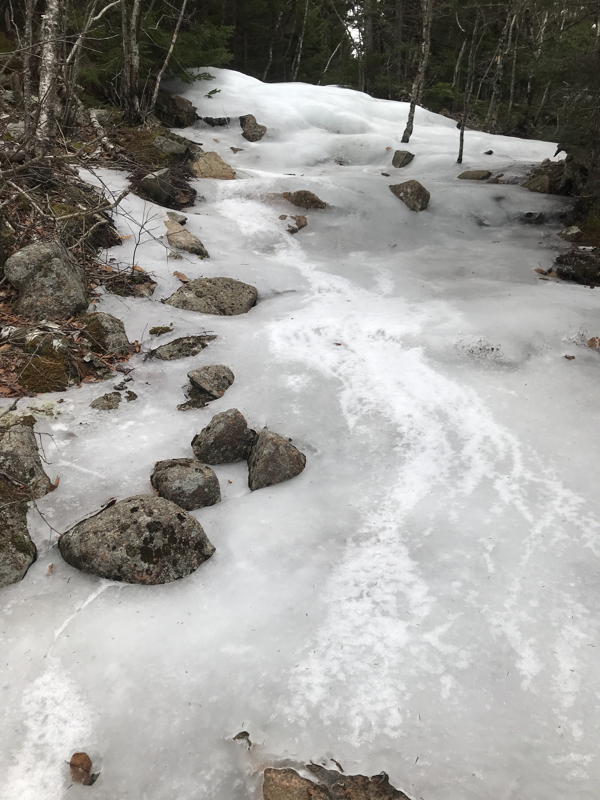 It's all ice. 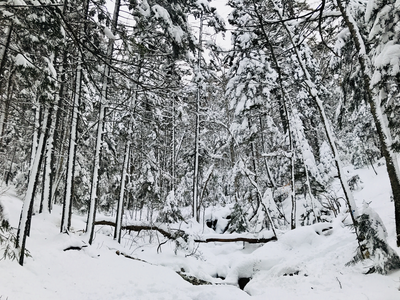 All of it. Buy some crampons or run roads. 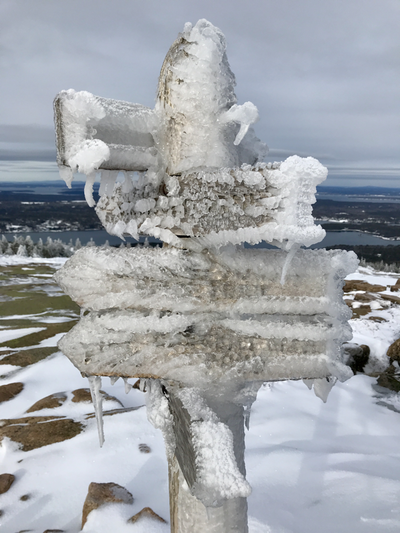 It has been very cold on the island the last few days, high’s in the teens, lows in the single digits and with a 15 mph wind coming out of the northeast that brings the wind chill down to -10 most mornings and throughout the day. 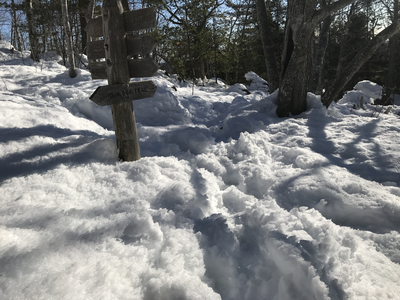 It’s snowed several times with light dustings and left almost everywhere with an inch or more of hard crusty snow that has a layer of ice under it. 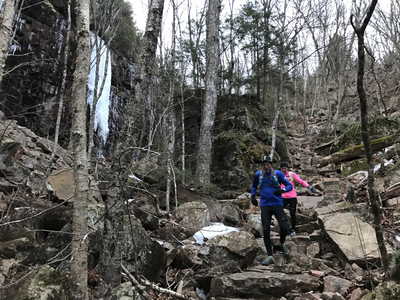 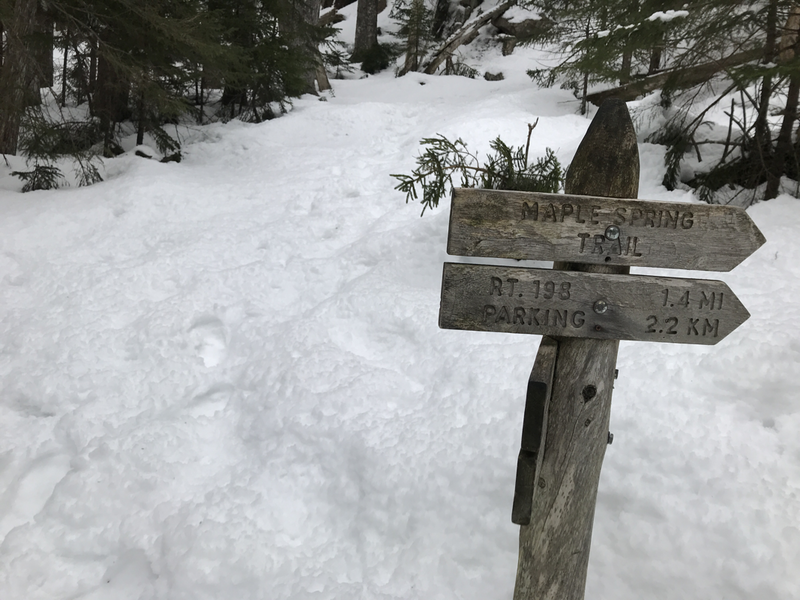 The carriage roads are all runnable without spikes or screwshoes, just gets slippery in sections where the ice is exposed. 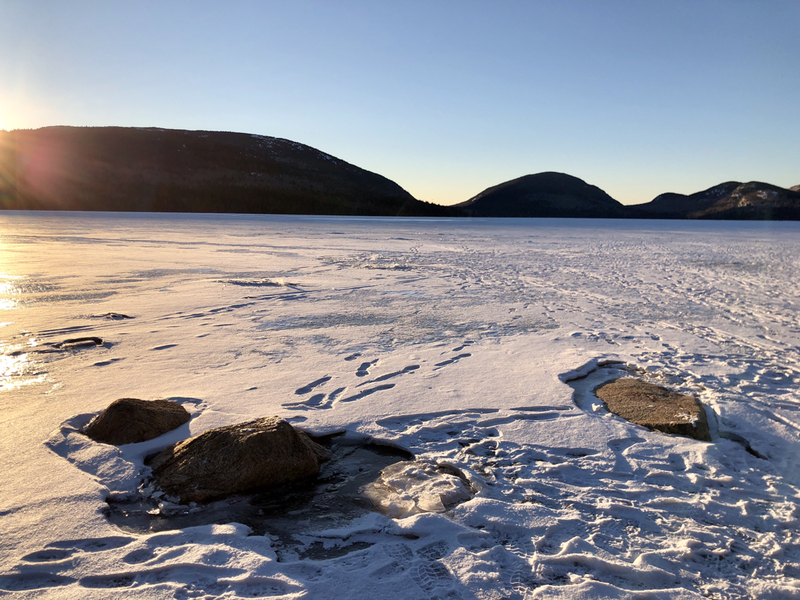 All the way around Eagle Lake and beyond is pretty consistent. 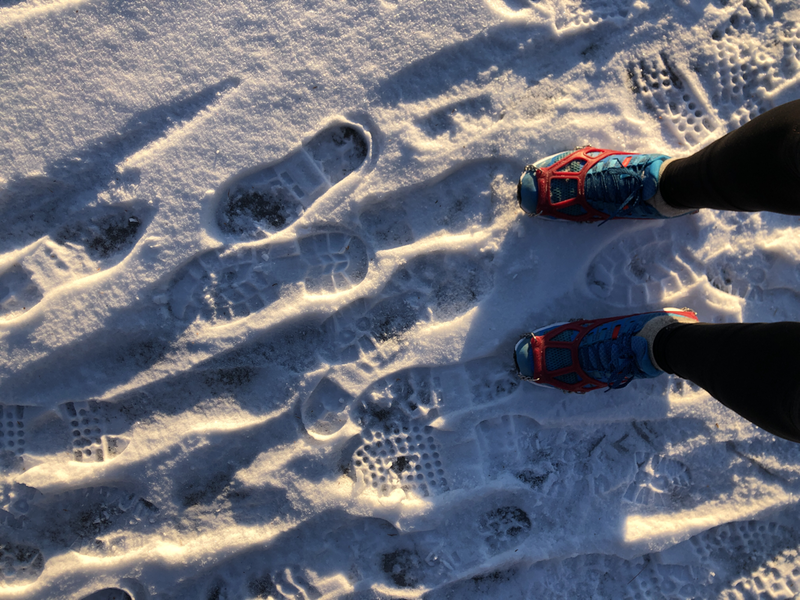 Runnable, with a few sections of deeper snow but it’s hardened in the cold and you can just run with regular shoes. 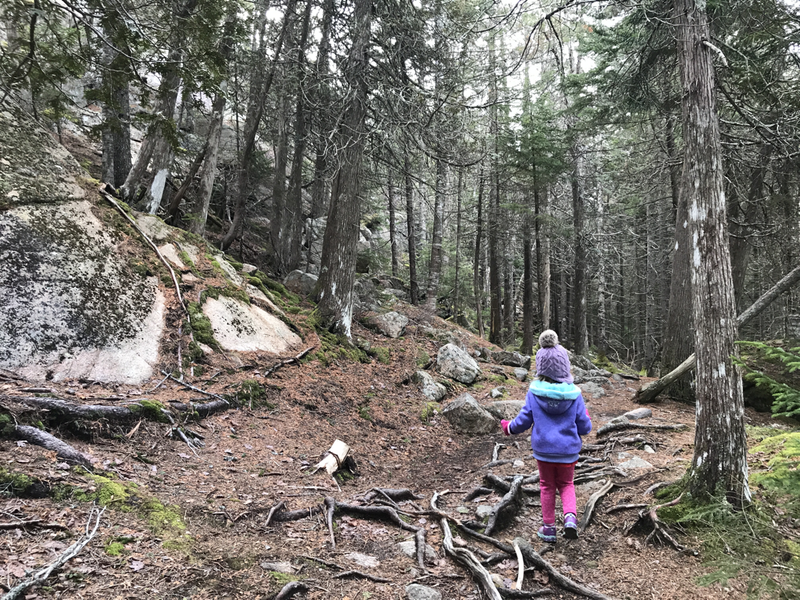 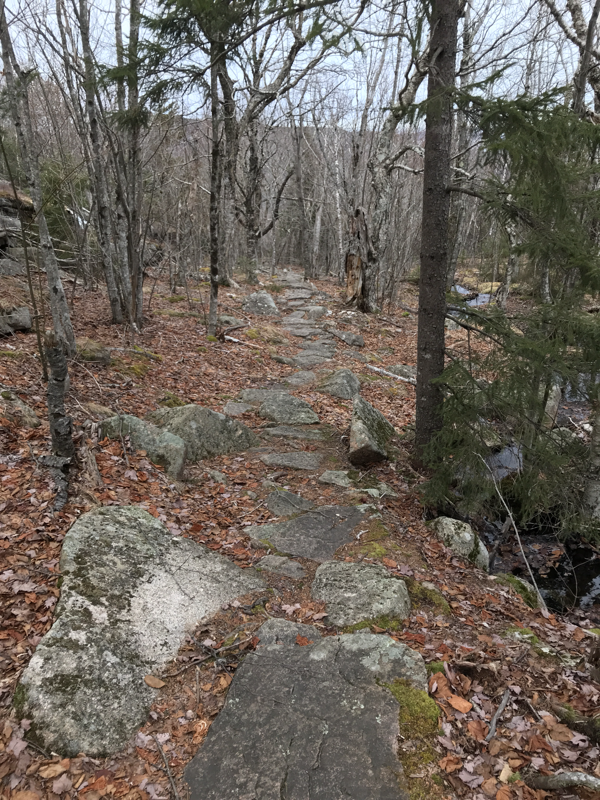 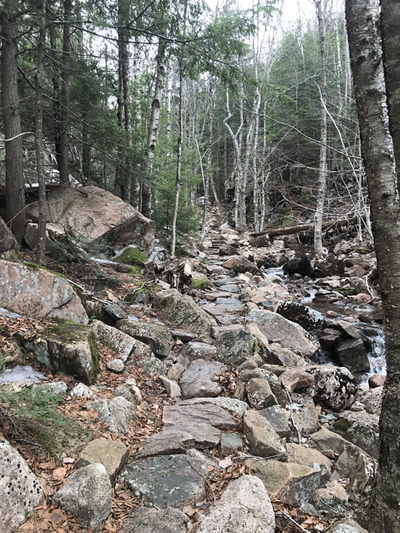 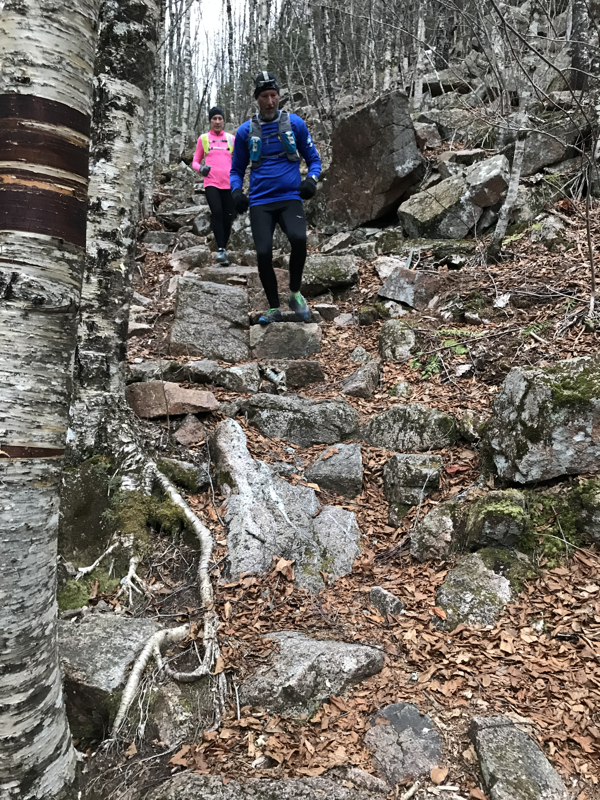 The trails are similar, but because almost all the granite steps end up freezing over with ice, it’s just safer with spikes on in the trail sections, or at least screw shoes. 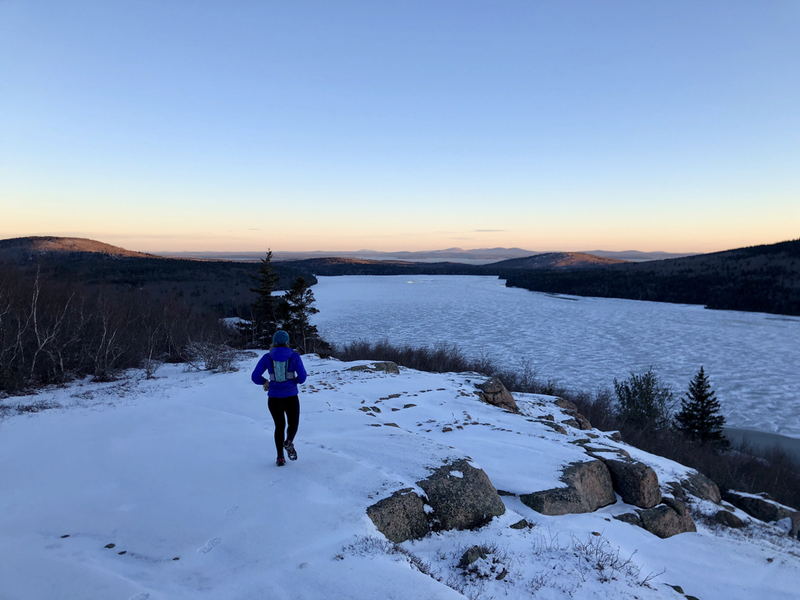 Not enough snow for skiing or snowshoes, but definitely still some great running conditions. If you stay out of the wind at least. 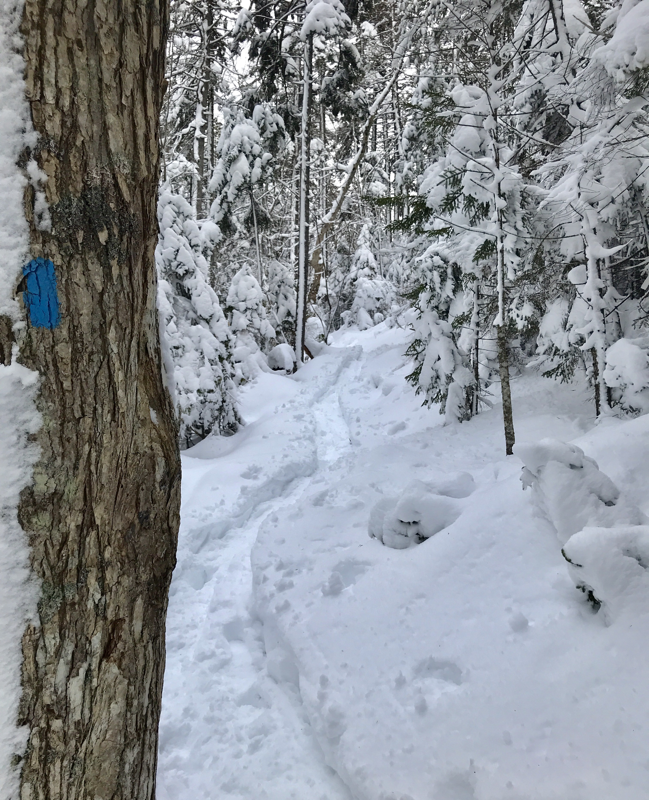 Snow falling over the last 12 hours has left a couple inches in the valleys and 3-5 inches of wet snow on the summits, covering up a lot of ice..
After the snowstorm on Friday and into Saturday that dropped 3-6 inches of snow the trails had new snow. Several areas still had snow to melt still so it just added to it. 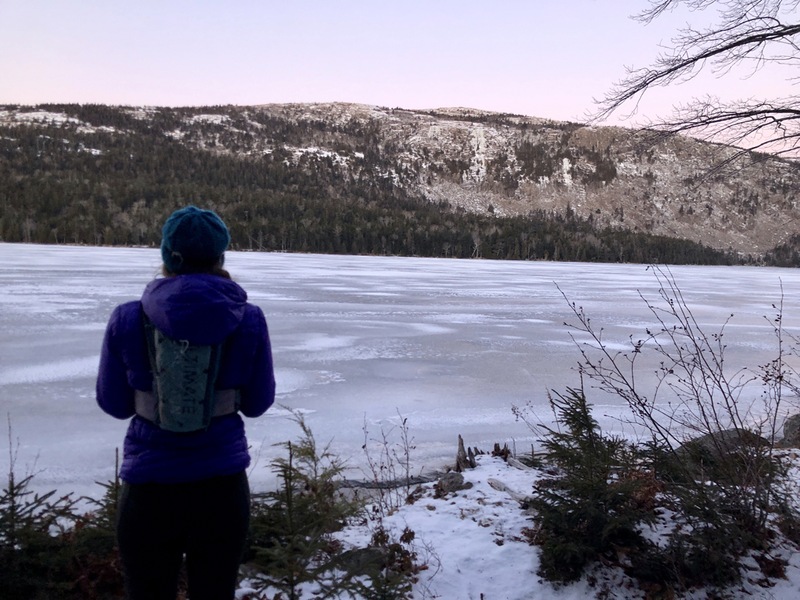 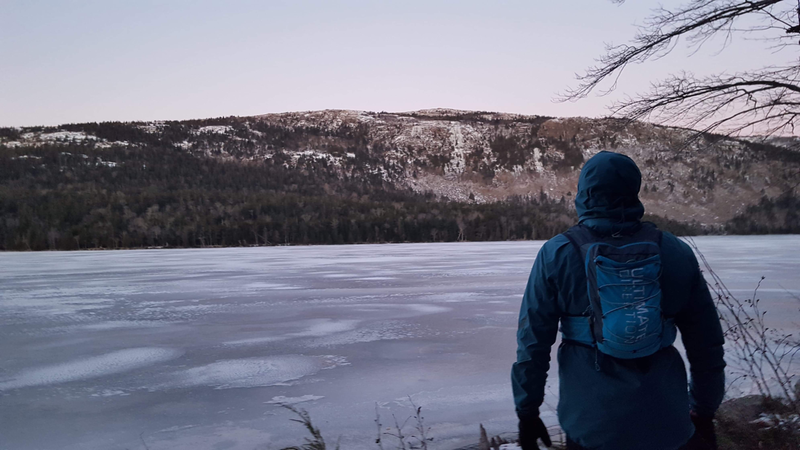 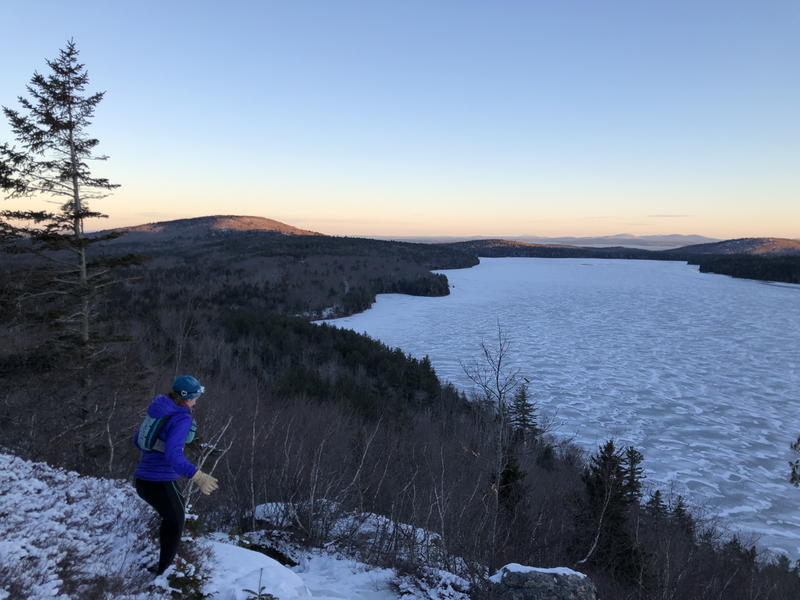 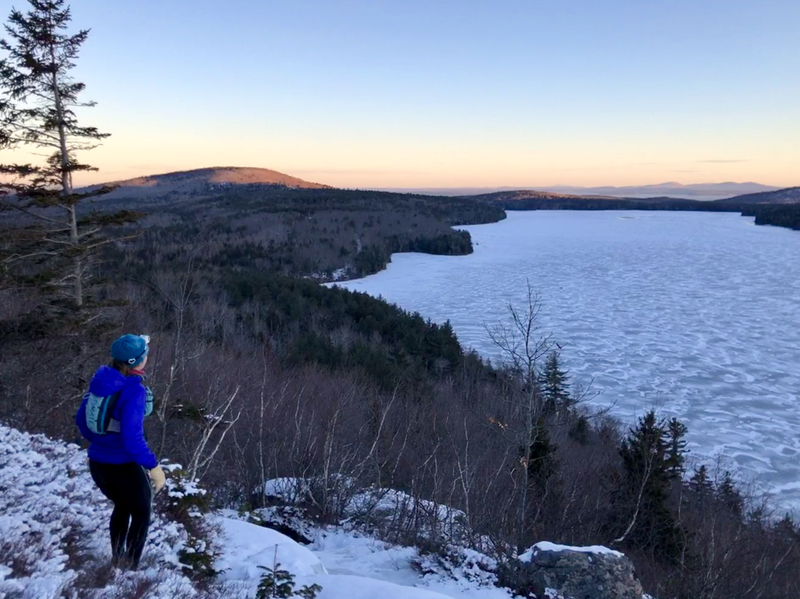 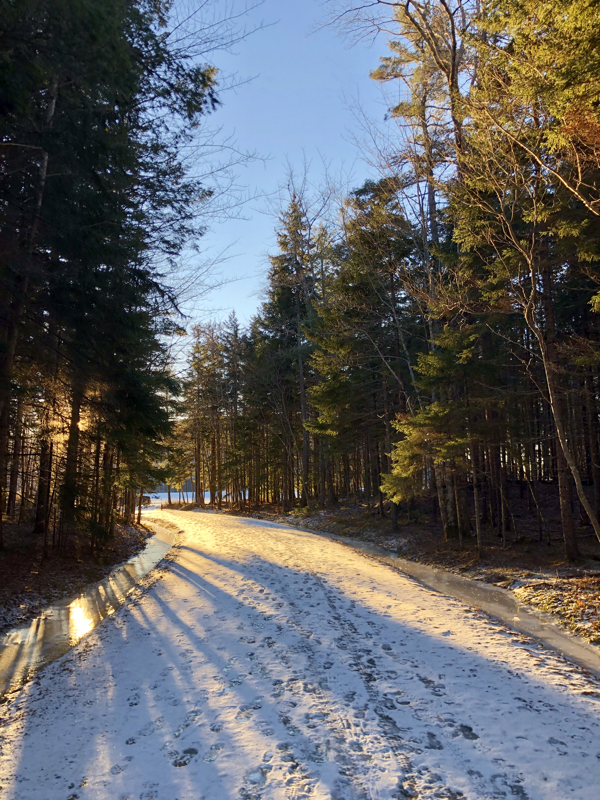 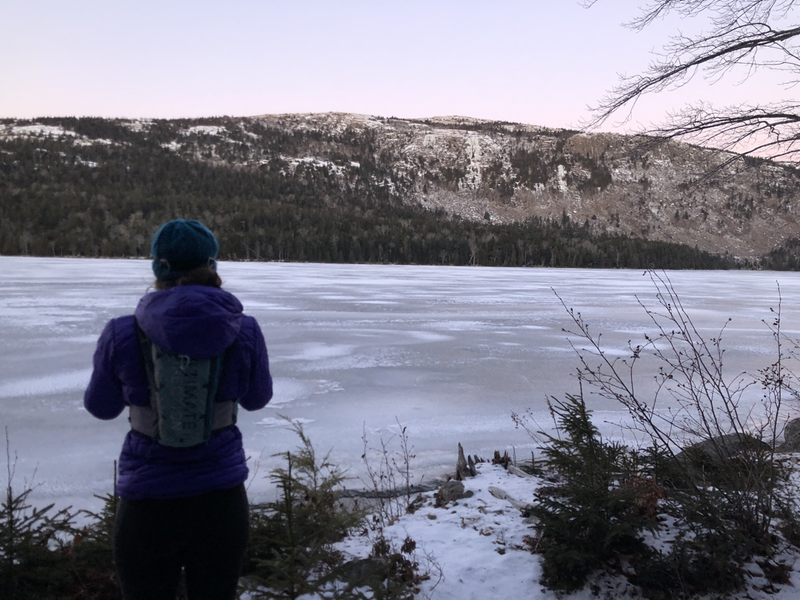 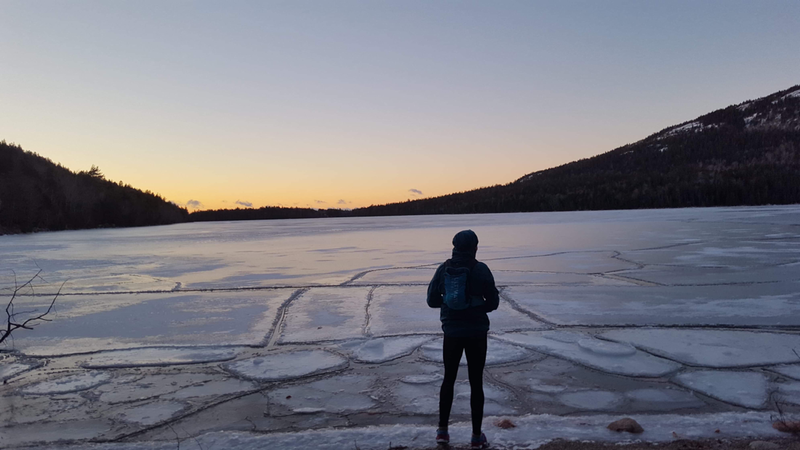 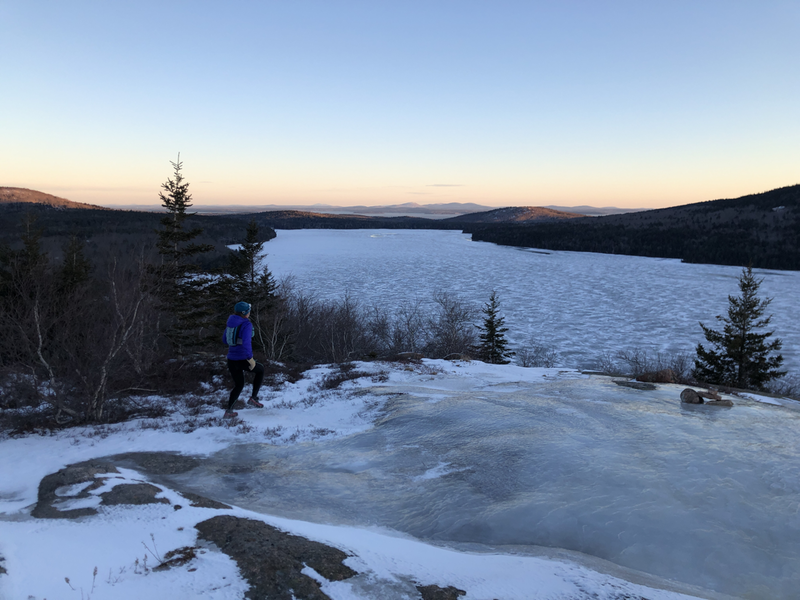 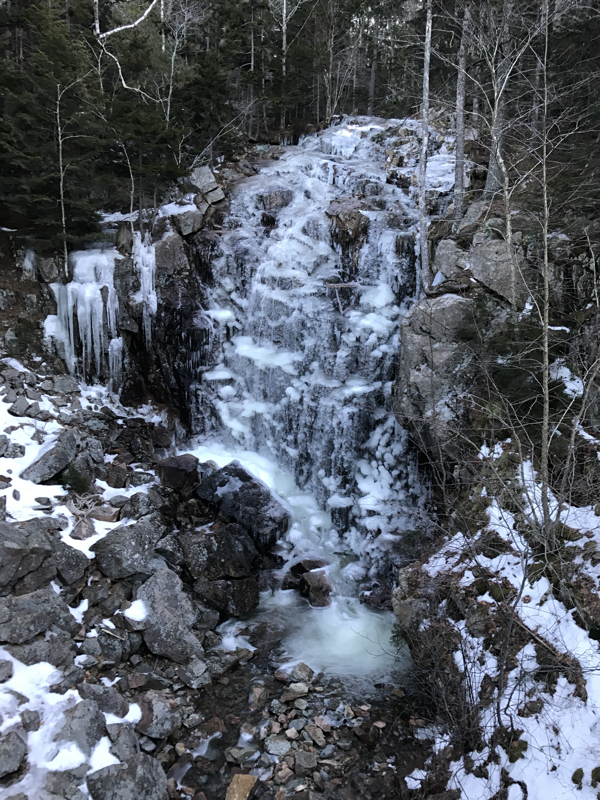 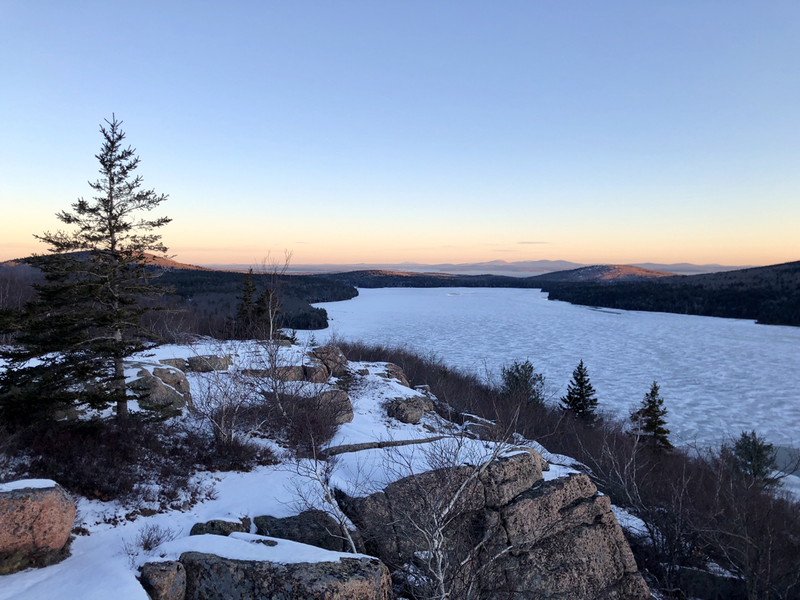 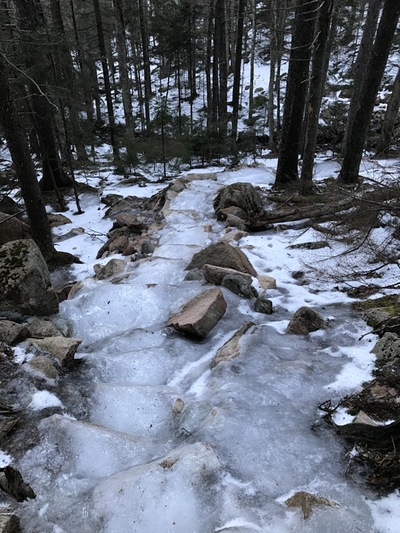 Early morning activity has a lot of ice on the trails, but if you wait until late morning/afternoon for your hike or run, it’s much easier passage as all the ice has turned to running water. 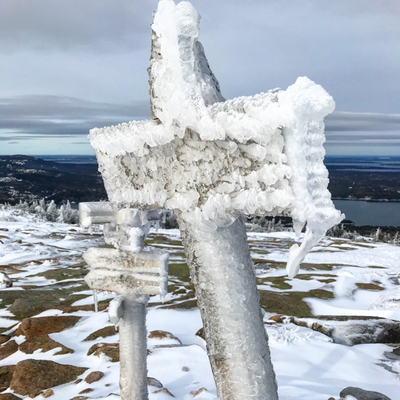 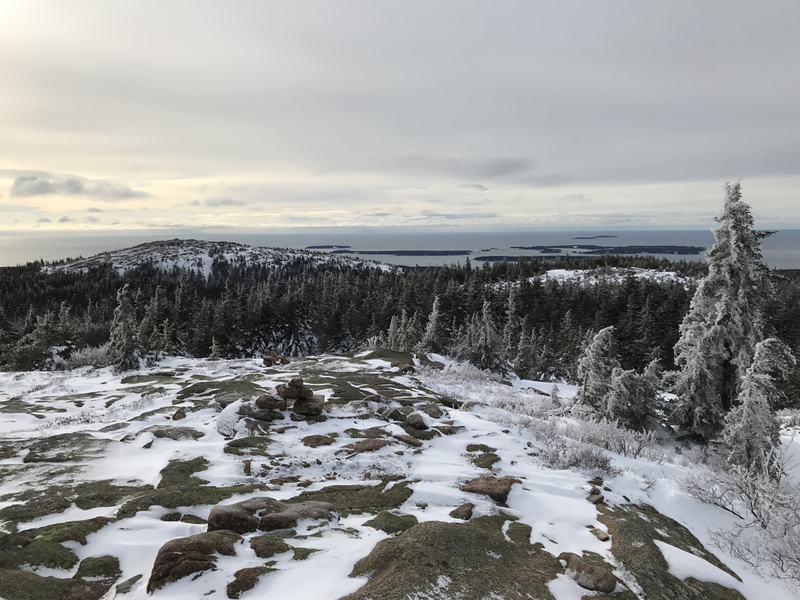 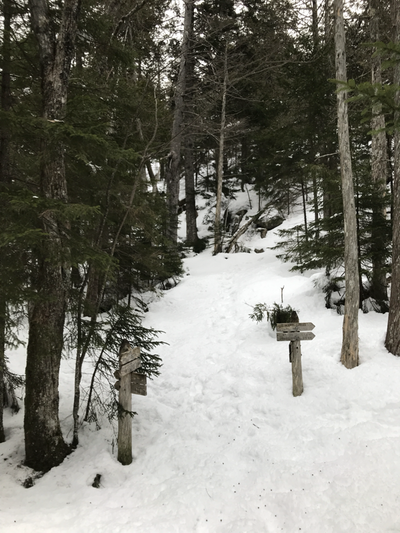 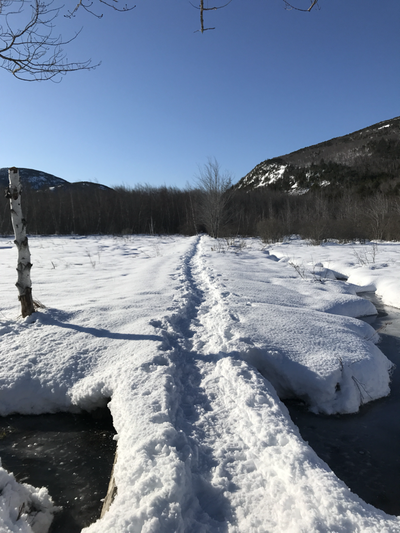 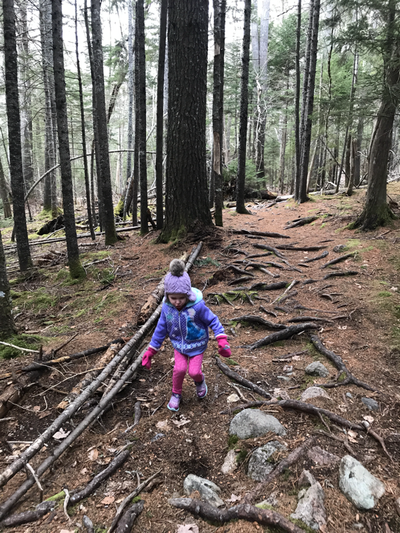 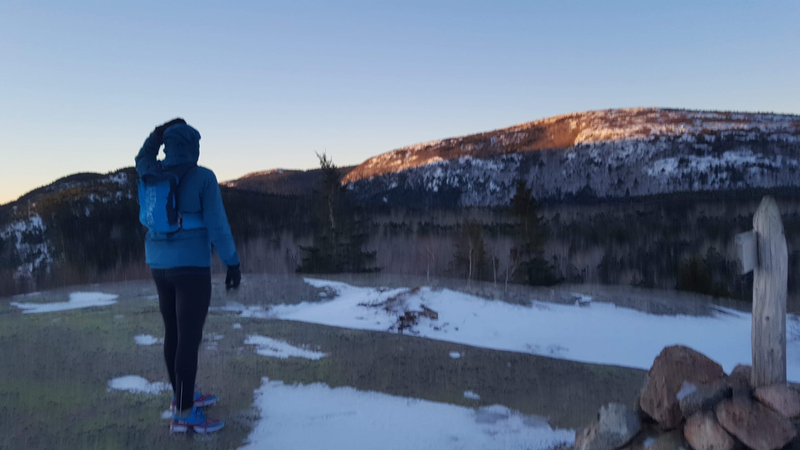 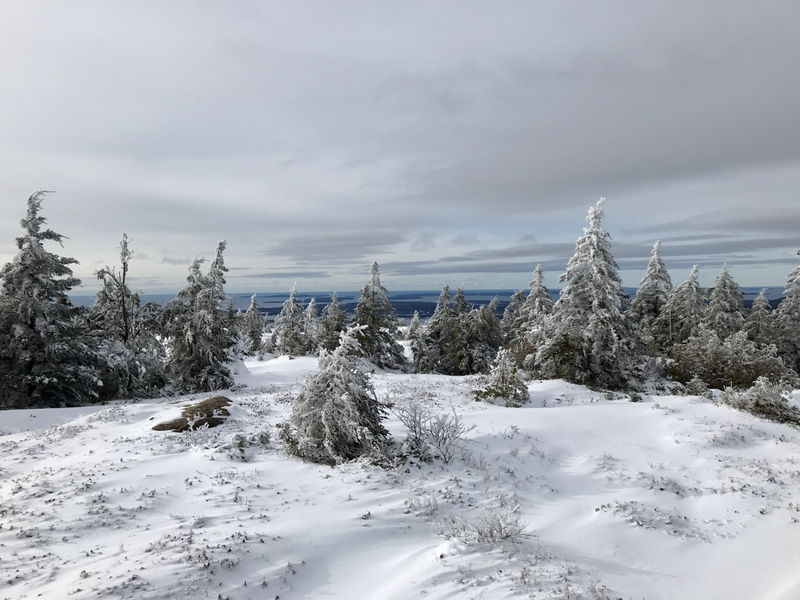 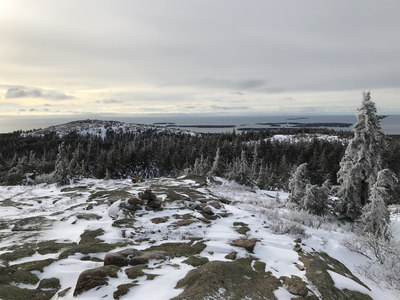 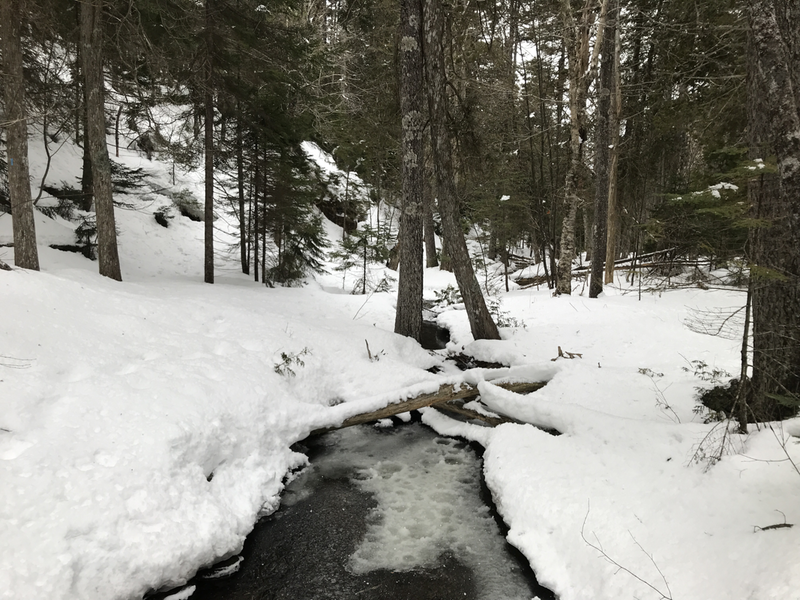 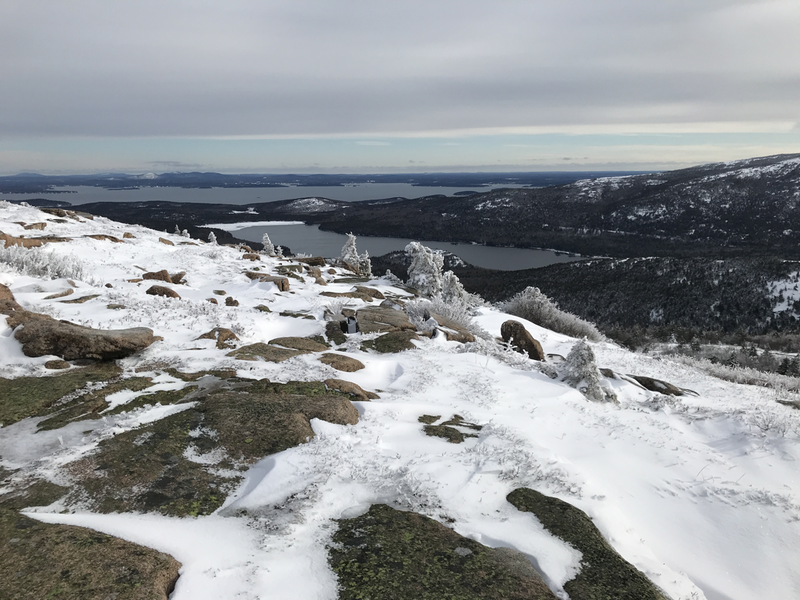 Parkman, Baldy, Maple Spring, Grangent, Sargent, Sargent East Cliff, Duck Brook Trail, and Gilmore Mountain are all snowpacked. 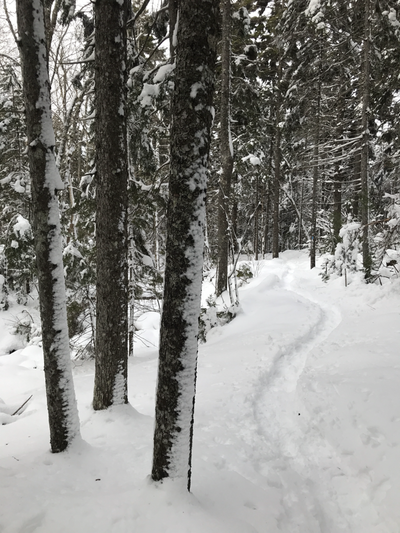 Penobscot down to the treeline is icy and snowpacked but once you hit the trees it’s not bad and dirt patches are common. Asticou trail is unbroken snow. 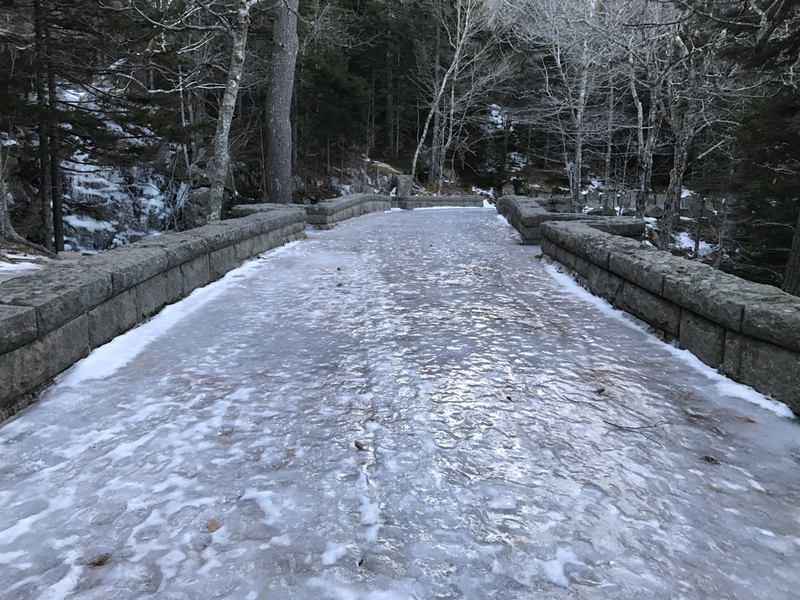 The carriage roads are terrible right now for any running, skiing or hiking. 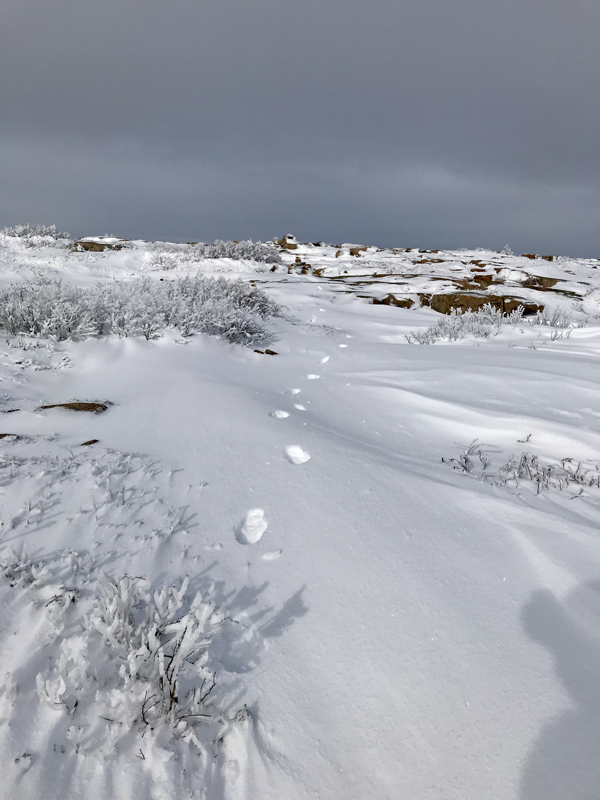 So many different foot prints frozen in the snow makes for a very uneven surface. 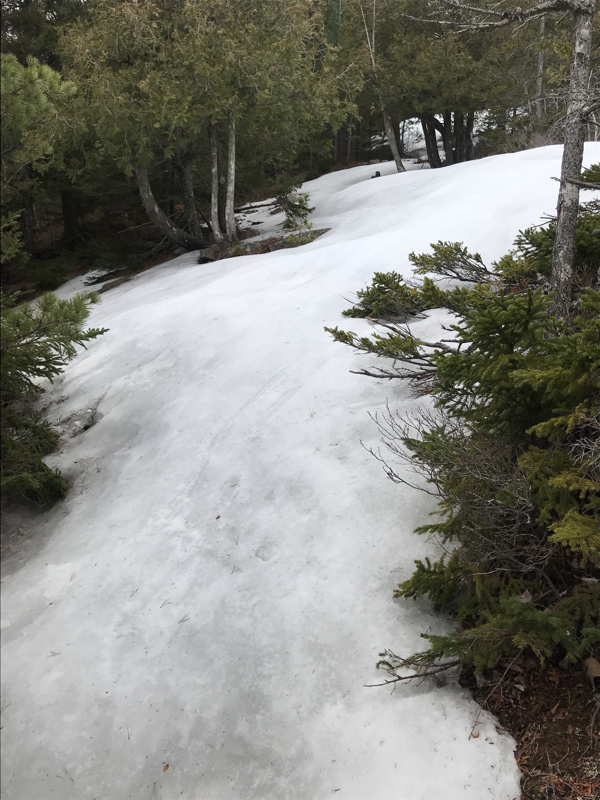 Really just needs to melt or get another 12” of snow to even it out. Hoping the next week of 40+ degree days melts it all. 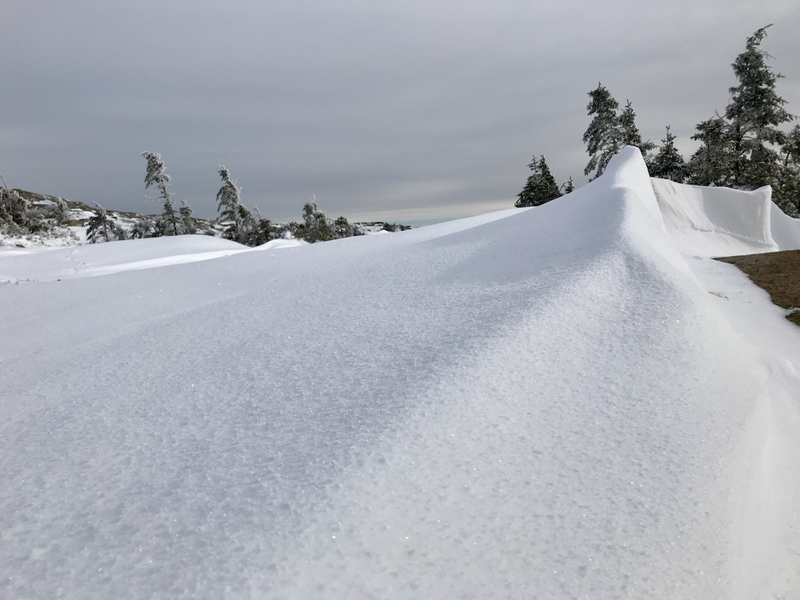 After almost (or over in some places) 24” of snow on top of what was already on the ground, the park is untouched in many places since the storm this week. 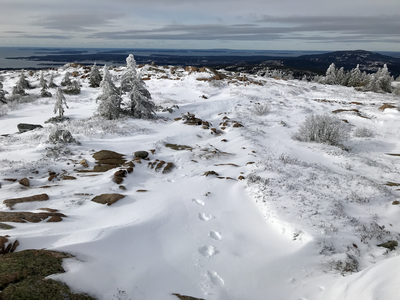 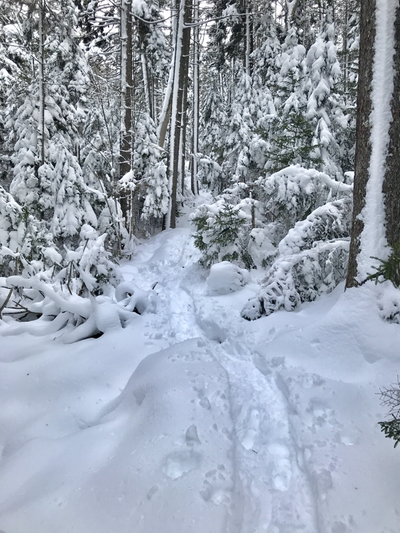 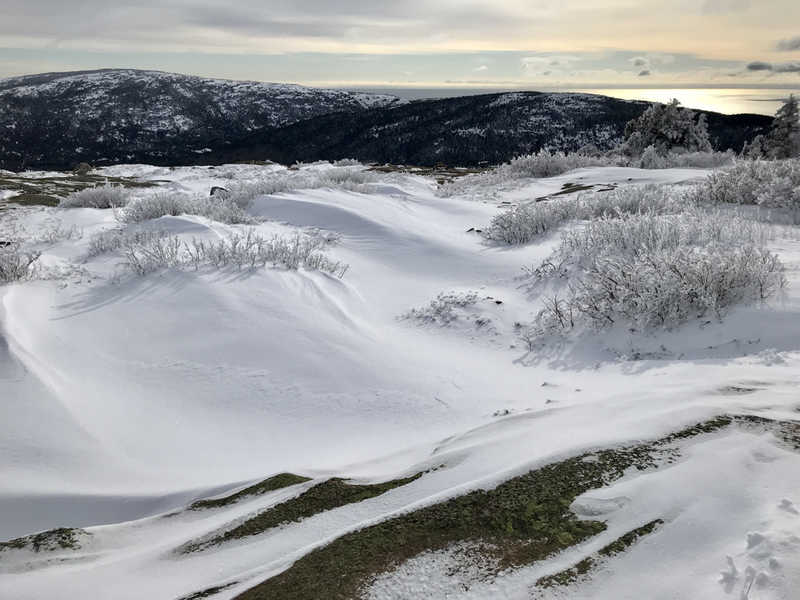 Without snowshoes or finding a packed down trail, the conditions are very challening with much of the snow up to your knees. 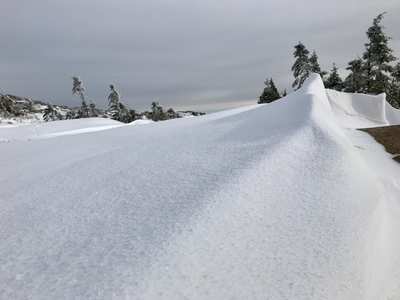 There is a hardening of the top of the snow with the recent cold so when it’s packed down, its solid. 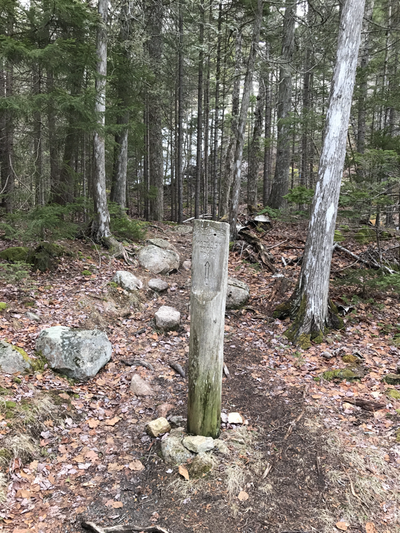 But it’s post-holing all day long when its not. 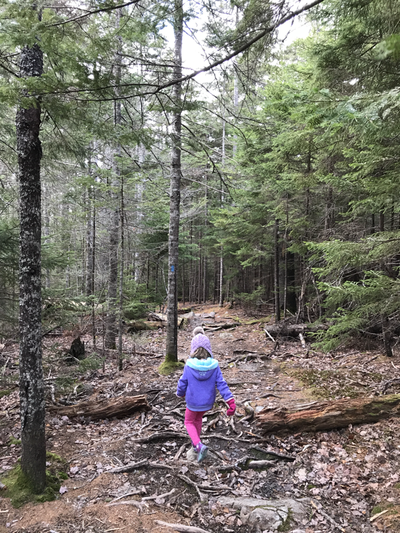 North Cadillac Trail - MDI kids recently took a field trip up the trail but only for a 1/4 of a mile and turned around. 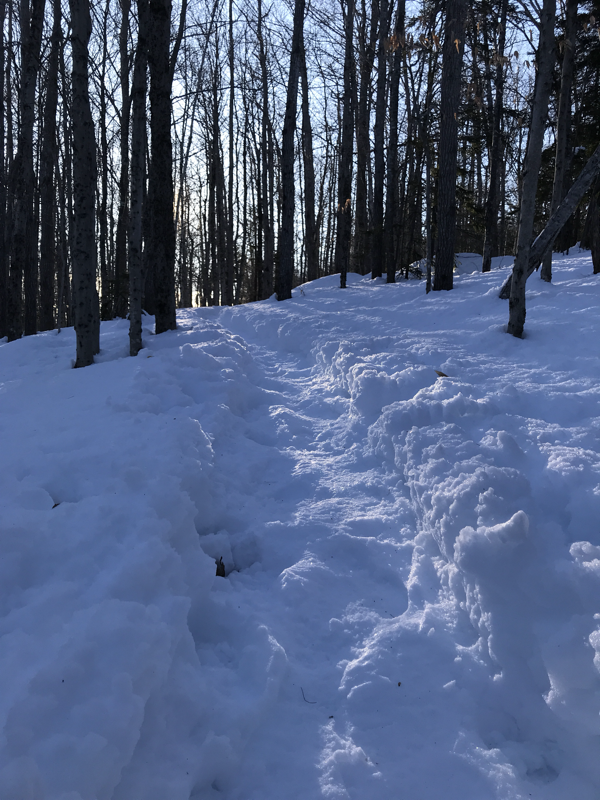 I turned around with them as it was both difficult to follow the trail with everything completely buried, and it would have taken me 4 hours to get to the top in that snow. 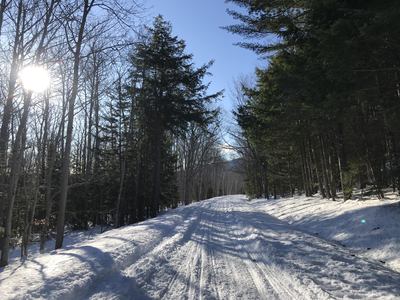 Park Loop Road - The road is snowmobiled and packed down. 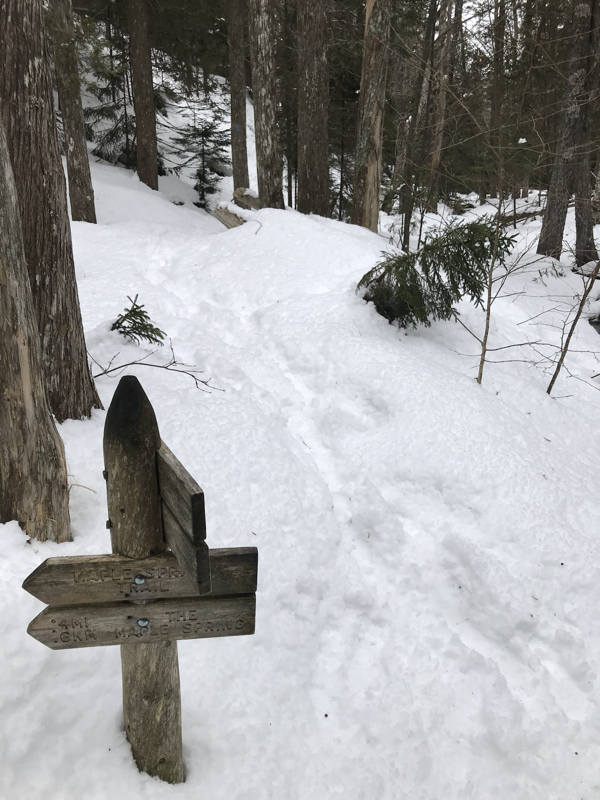 Some skiiers have tracks but its very solid and you can run this without spikes and get good traction. 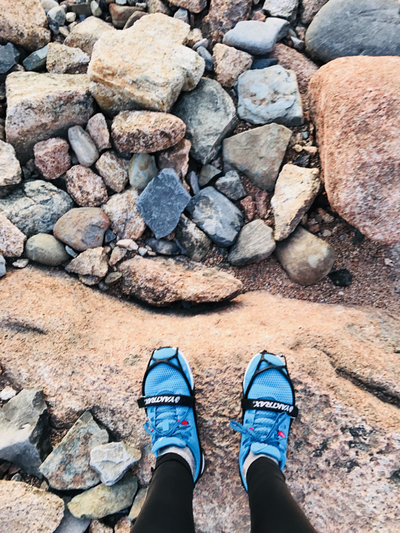 This is the best running option out there right now as it’s very well compacted. Kebo - Kebo from North Cadillac to Sier de Monts is just a few foot prints and a fat bike tire. Not packed down. Strathaden - A couple have packed down some of the trail with snowshoes and for the most part is pretty manageable all the way through. 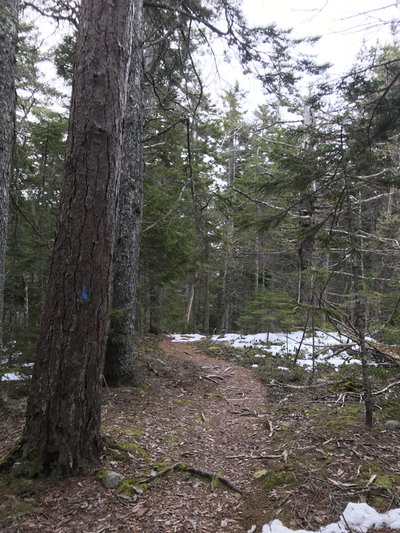 Hemlock Trail - Hemlock from the Jesup marsh area has more deer tracks than human but up to Dorr/Kebo Mtn intersection is manageable with some shoeshoe compaction. 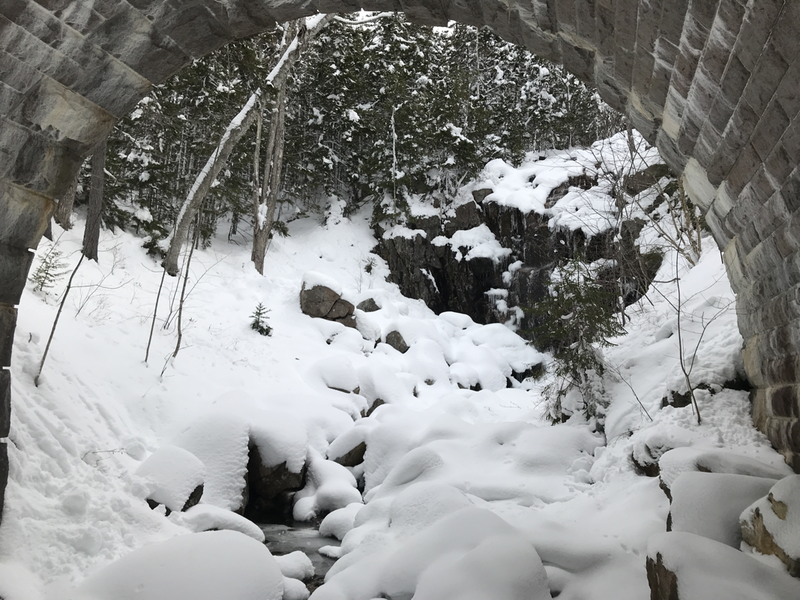 Nobody has gone up North Dorr, or on to the Gorge on Hemlock yet. 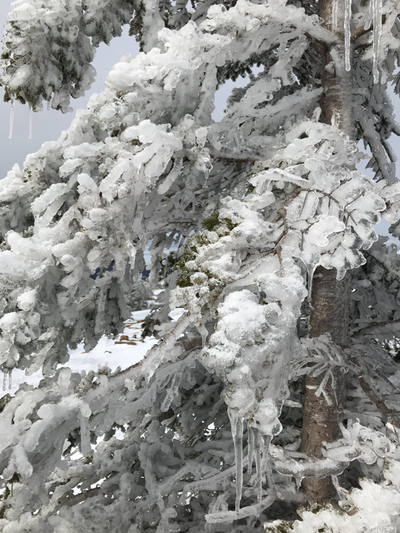 It’s all post-holing. 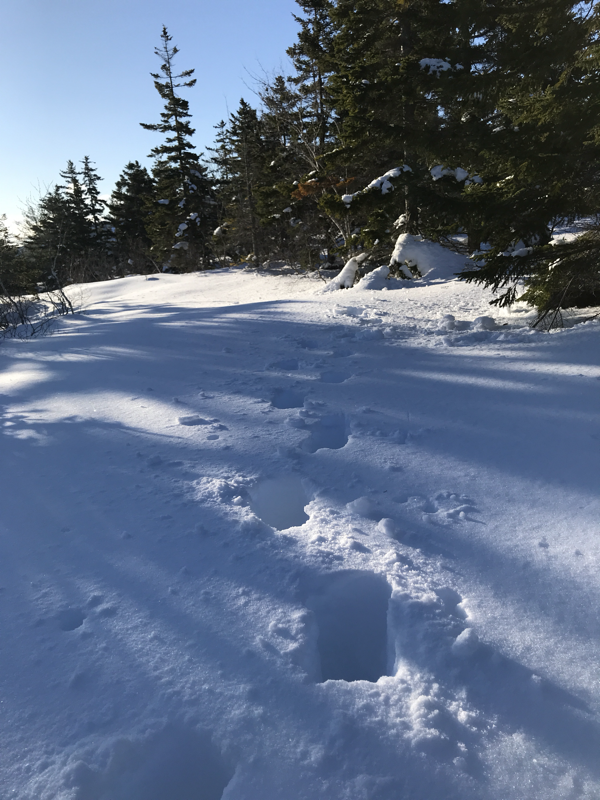 Kebo Mountain - Kebo mountain has tracks for the first 1/4 mile but then they turned around. 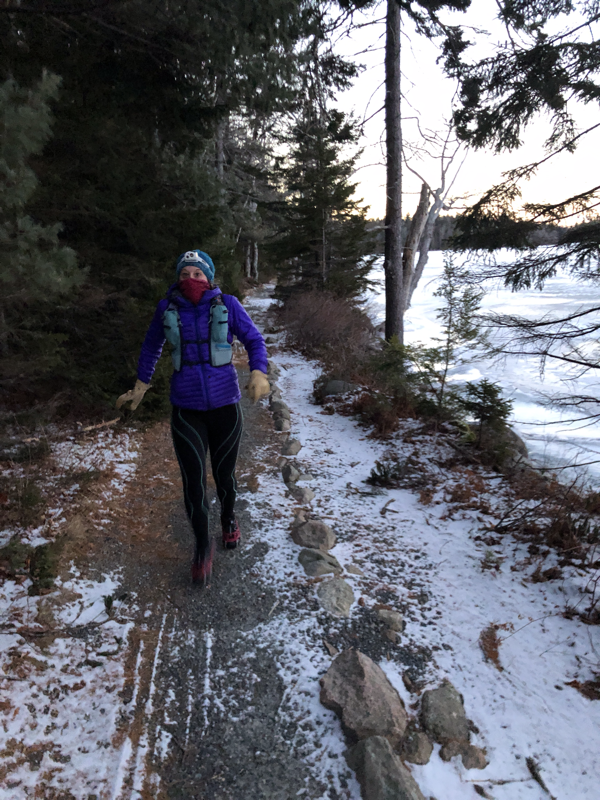 I tried to go on but the snow in parts were up above the knee and the pace was very slow. So nobody has packed the trail down from North Dorr to the Park Loop Road on Kebo Mtn. Day Mountain to the Triad Summit is now packed with two snowshoers who broke the trail today. South Cadillac I heard has lots of tracks and is manageable but I haven’t seen it yet. Beautiful out though, even if it was cold and slow. 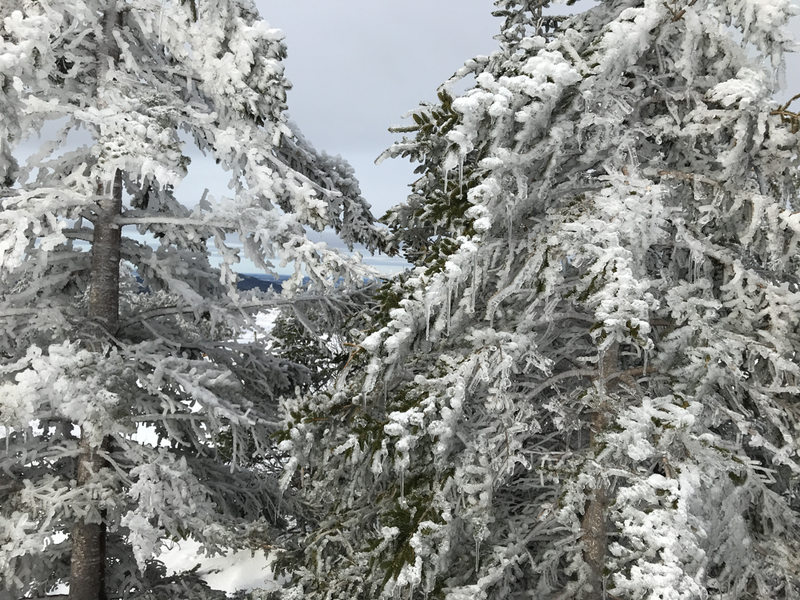 After snowing hard Thursday and dropping over 14” on most of the island, it snowed/rained most of Saturday. 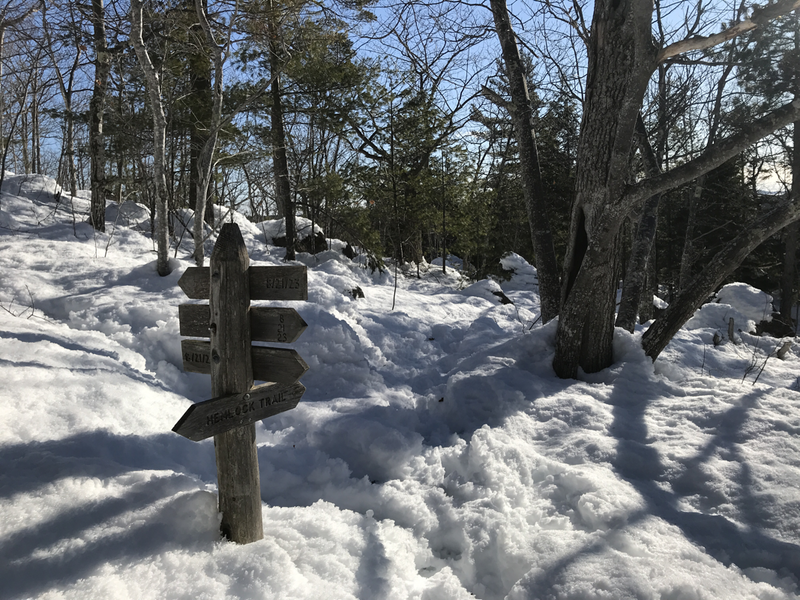 I got out this morning and with the carriage roads closed, started from the Norumbega parking lot. 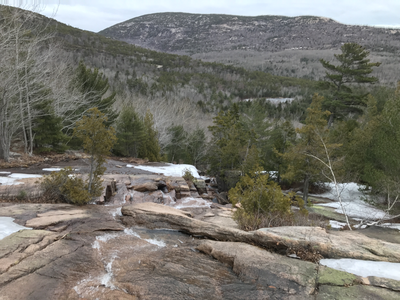 Took Hadlock Brook Trail up all the way to the top of Sargent. 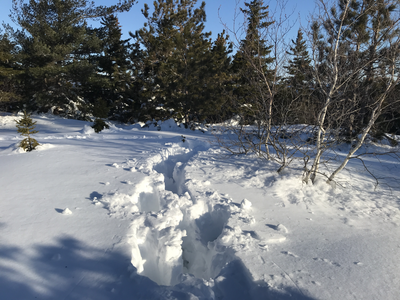 The entire trail is passable with regular shoes as the wet snow has compacted well beneath snowshoers prints from the last two days. 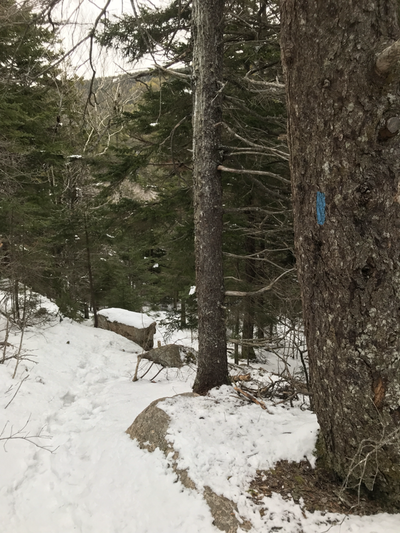 A clear path to the top and holds up (for the most part) without punching through. 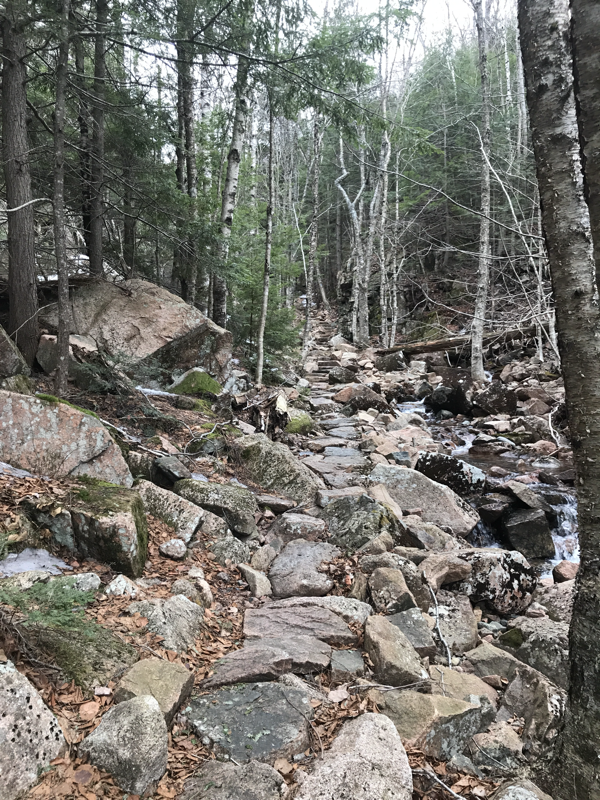 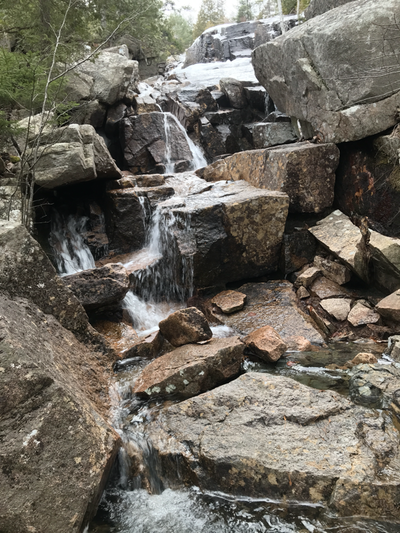 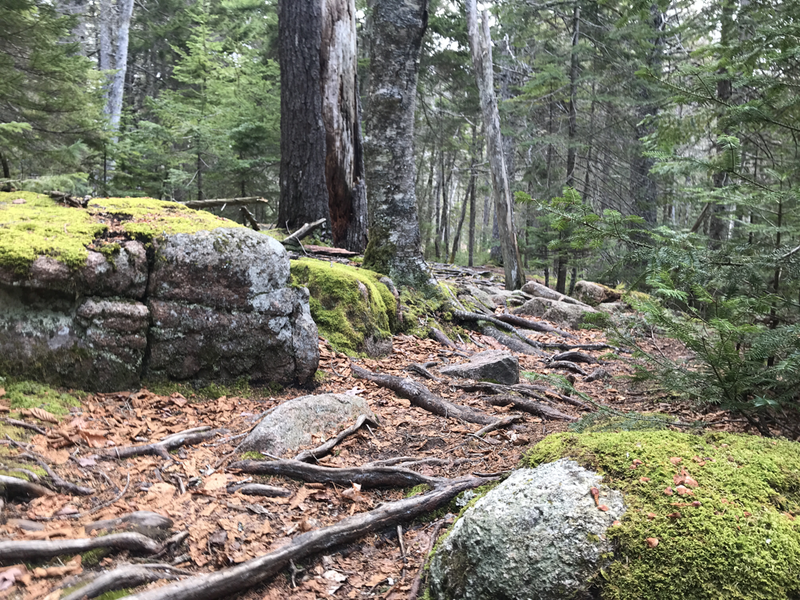 I avoided any trails that were not packed in, Amphitheatre and other offshoots of Hadlock Brook were untouched and would be pure post-holing all the way up. 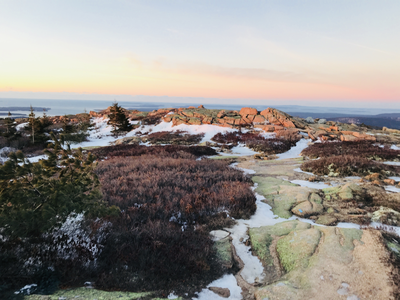 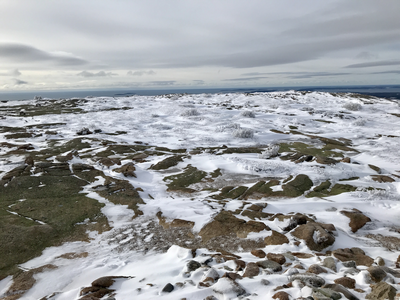 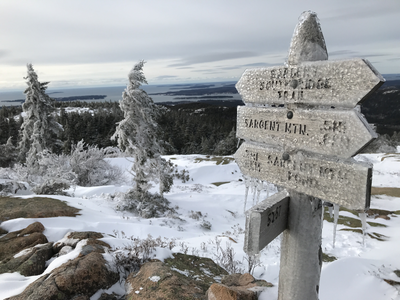 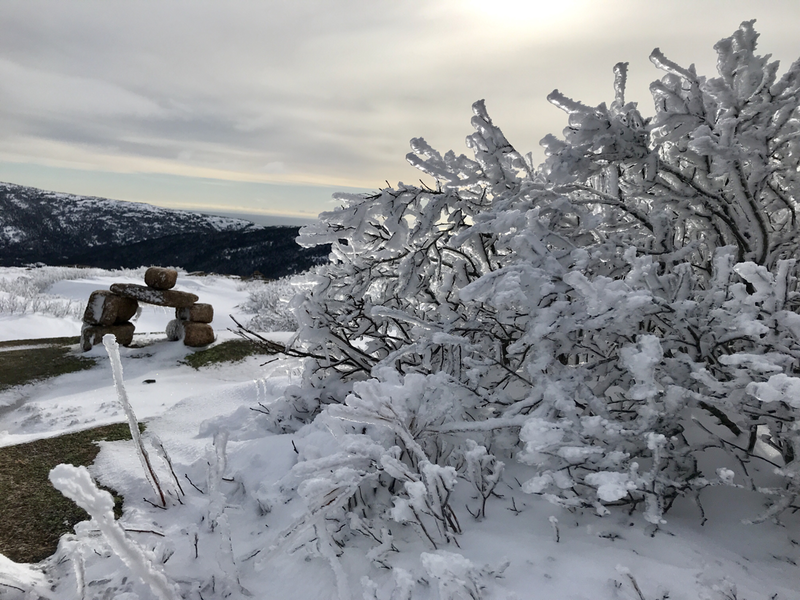 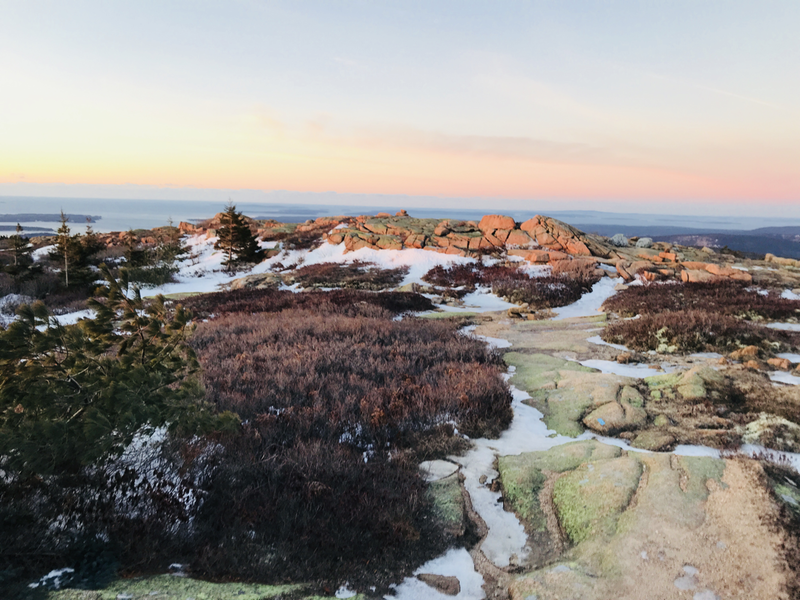 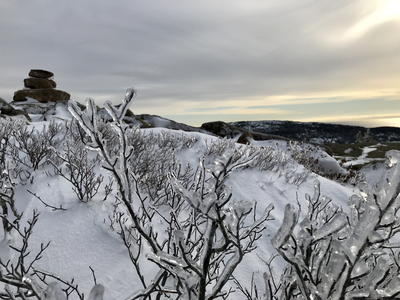 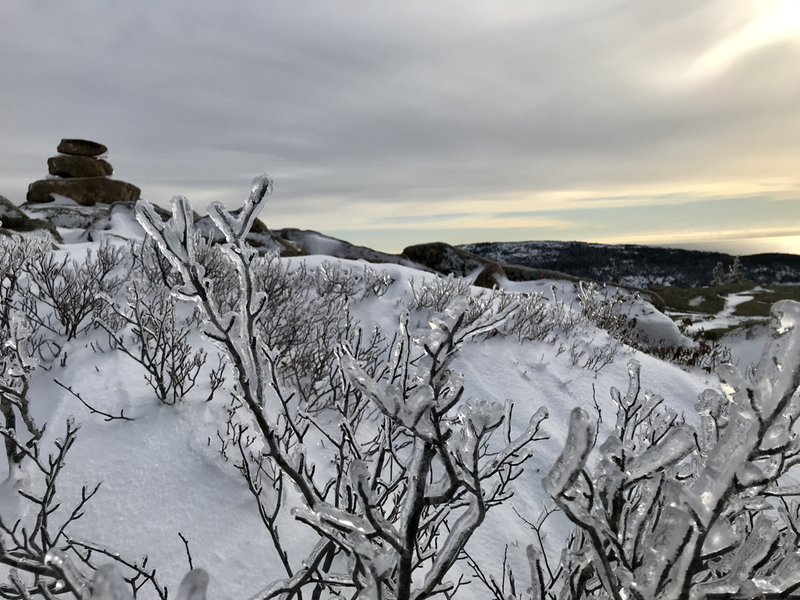 The top of Sargent is a winter wonderland of ice and snow, the most I’ve seen all winter after it was drenched in sleet throughout Saturday and froze overnight. 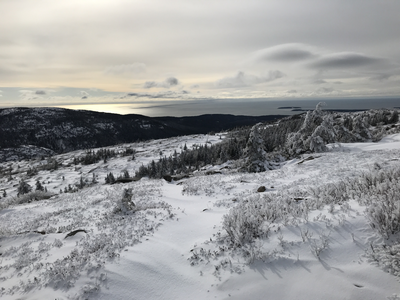 Saw the snowy owl over by the East Cliff’s Trail and watched it fly down the valley and right back up to the Sargent South Trail. 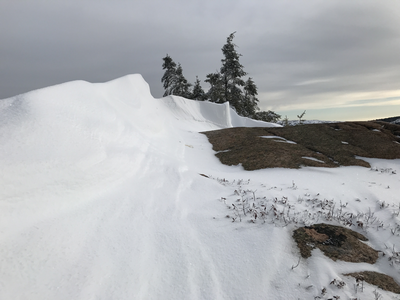 I thought I’d see it again on the way back but it’s all but impossible to spot that without it flying in these conditions. 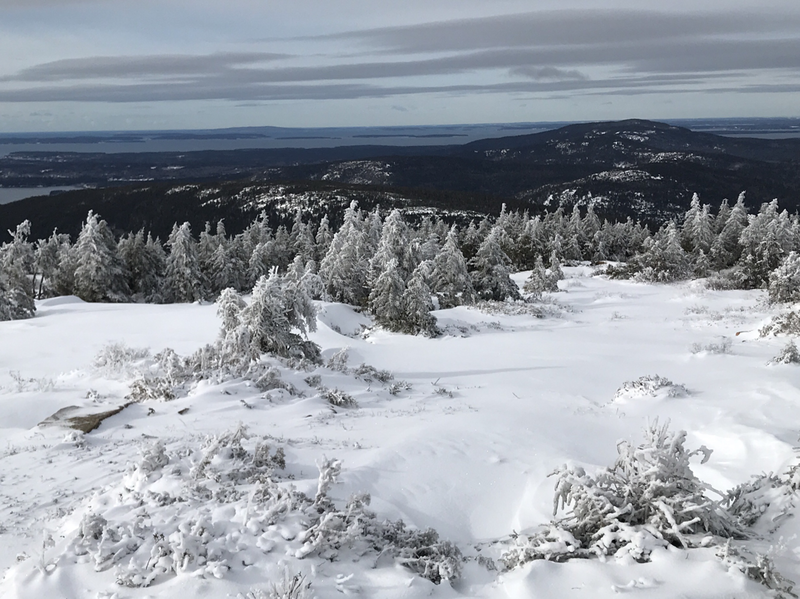 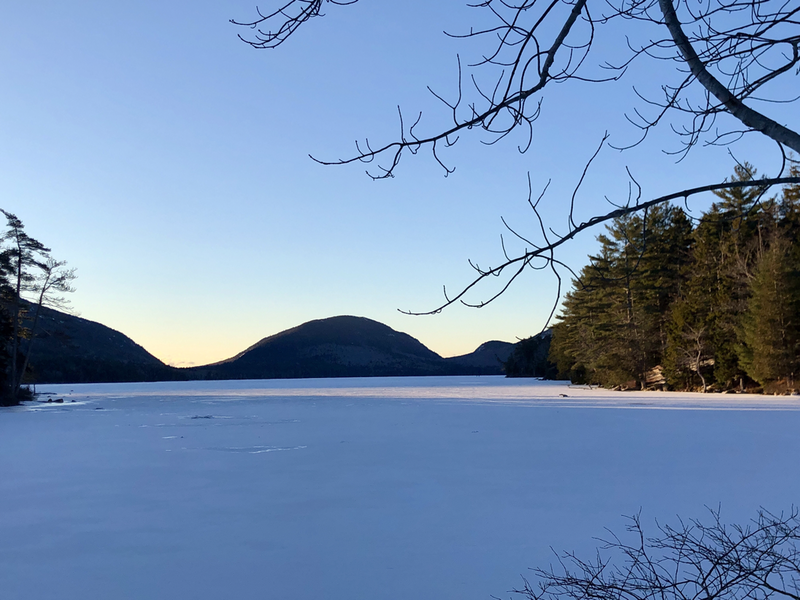 With another 12 inches of snow coming on Tuesday, it’s going to be snow pack for some time, but at least for now you can stay on top and hit it without snowshoes. 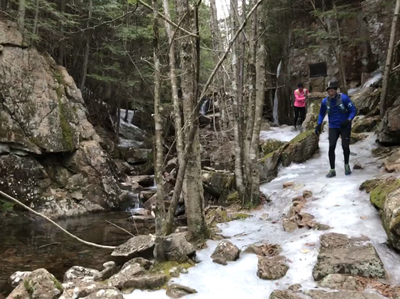 Down to the last few stretches of ice, ran this loop around Kebo, the Tarn, and up Murray without any spikes or screws. A few short stretches down the Gorge are still covered in patches of ice, but most of the park is generally clear. 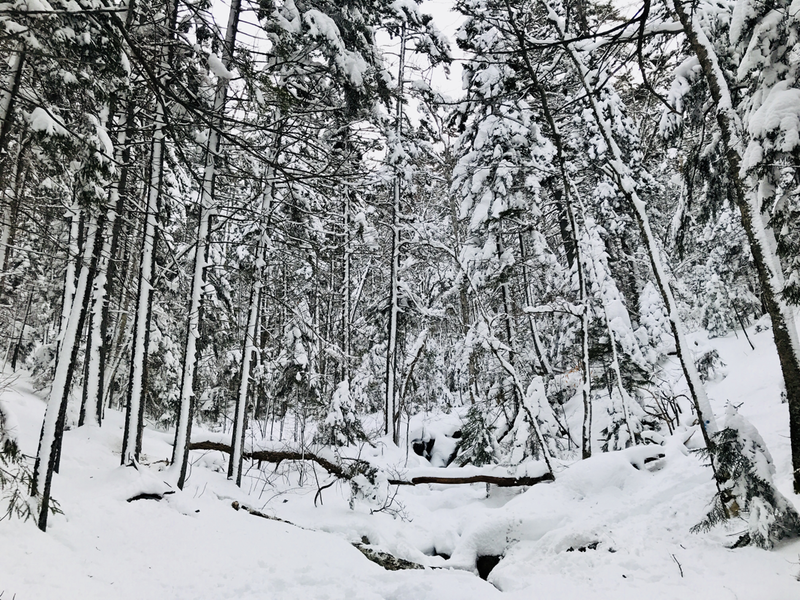 Of course, just in time for 12 inches of snow to fall tonight. Hadlock Brook trail with my daughter Maggie. 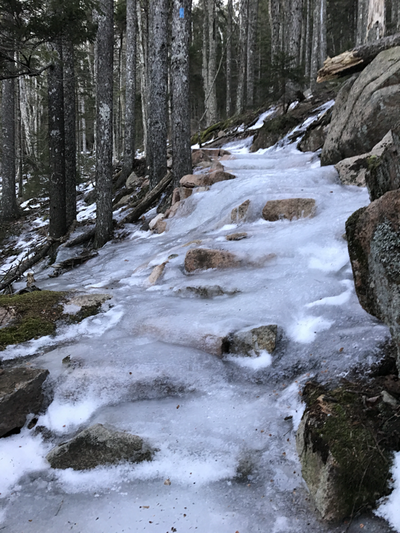 Almost no ice, trails are exposed and fully runnable without spikes or screws. 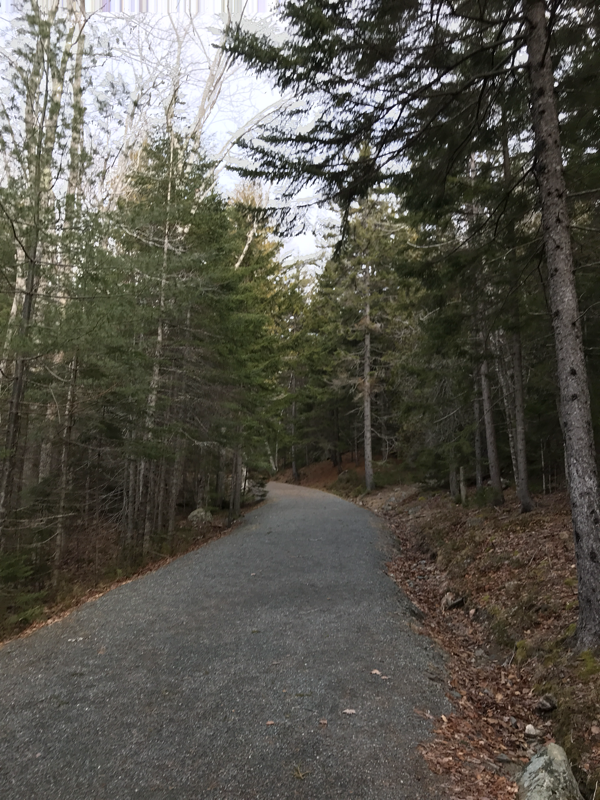 Carriage roads are closed for mud season. Kebo up the Gorge to the top of Dorr Mountain. 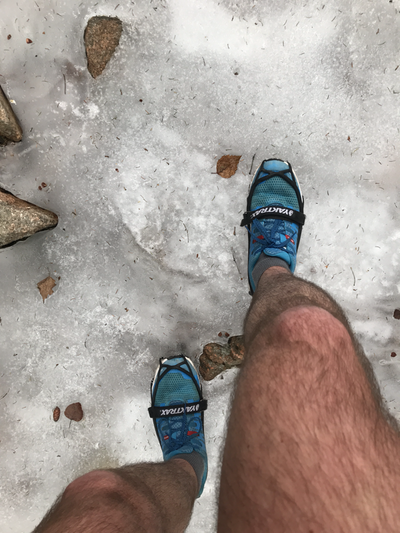 No ice until you get to the Gorge and then you hit some patches where I put on YakTraks. Which of course it ended up being ice I needed Spikes but you can get around it with trees. Most of it is very short 10-20’ stretches so you can just go around into the woods and skip it. 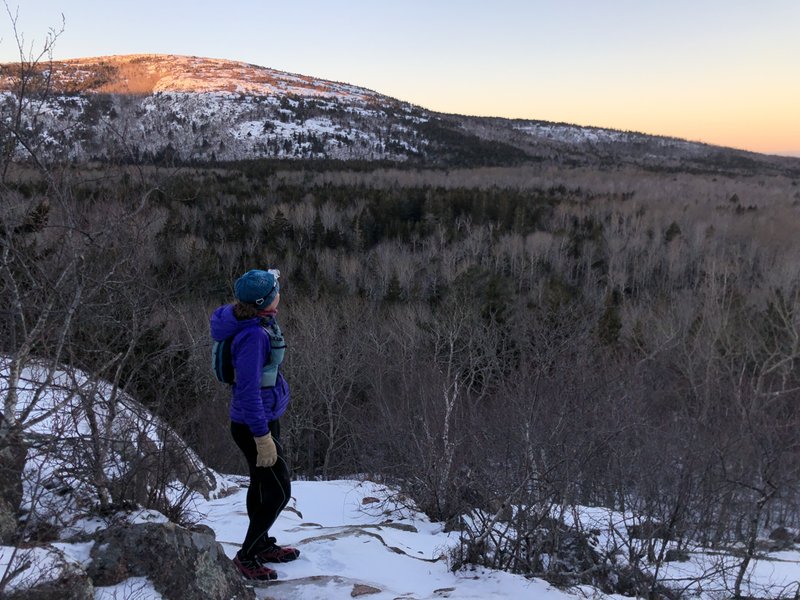 Dorr South Ridge has one tiny 10’ stretch near the summit, then it’s free fall all the way down without any issues. 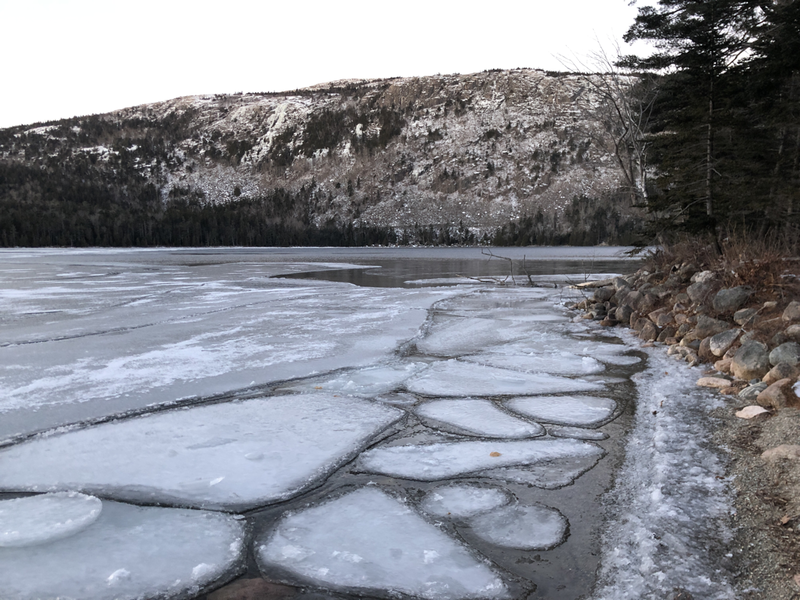 I went up Canon Brook crossing my fingers it wasn’t all ice but aside from one stretch where it was a full wall of ice, it was almost completely clear. 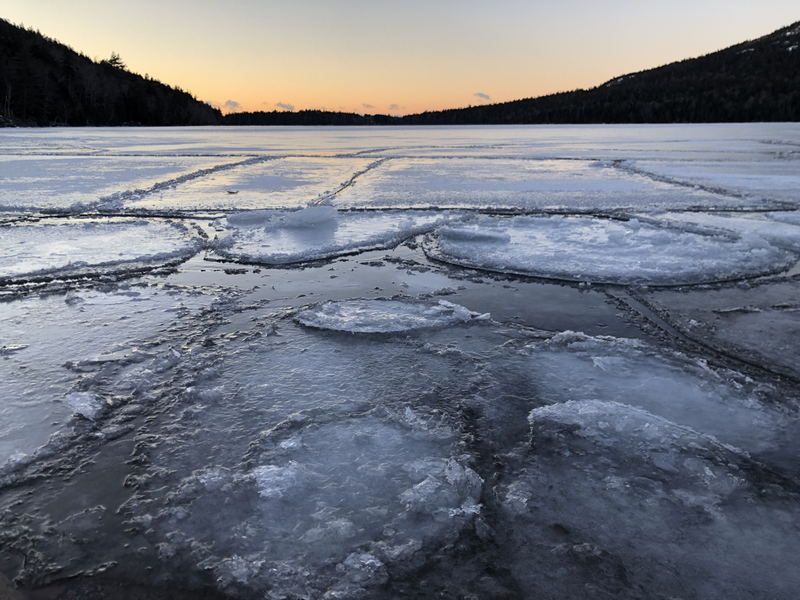 I could go around all the stretches of ice I found without using spikes. 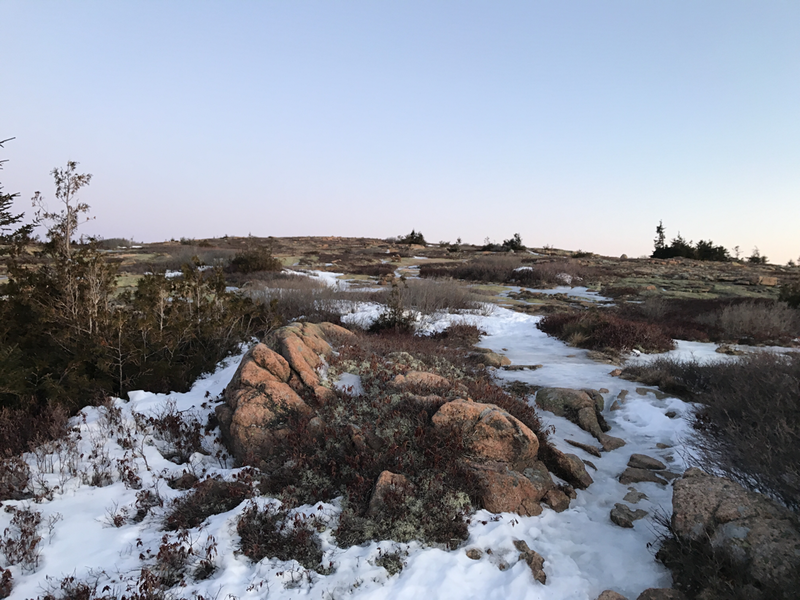 On South Cadillac it opened up and immediately the wind hit me and it was STRONG. 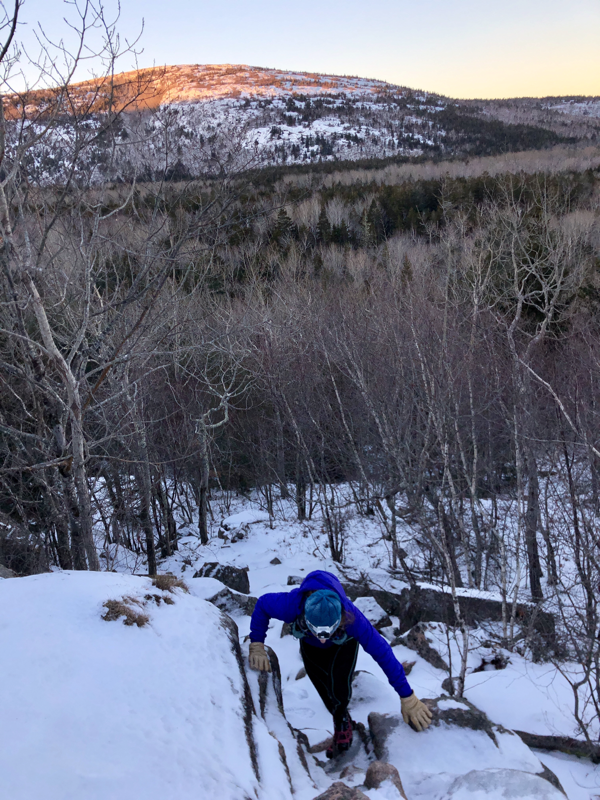 One of the strongest days of wind up there I’ve experienced and the temperature was 15 degrees colder, easily. 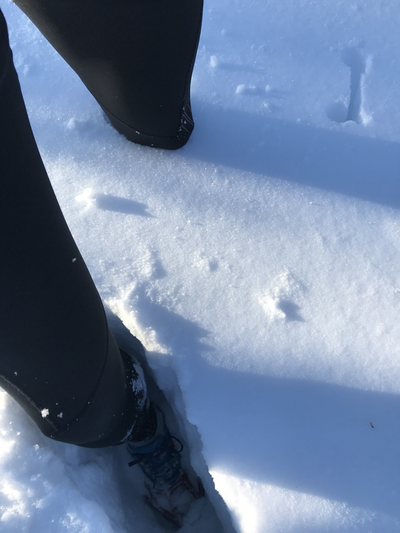 My 5” running shorts quickly became questionable. 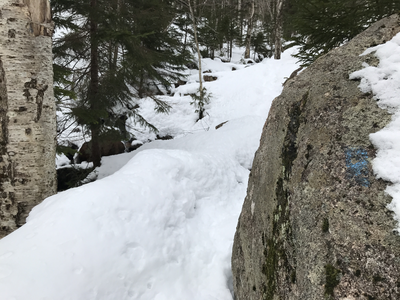 The south ridge of Cadillac itself is clear unti you get to the short drop down to the service road and that’s the iciest part of the whole park. 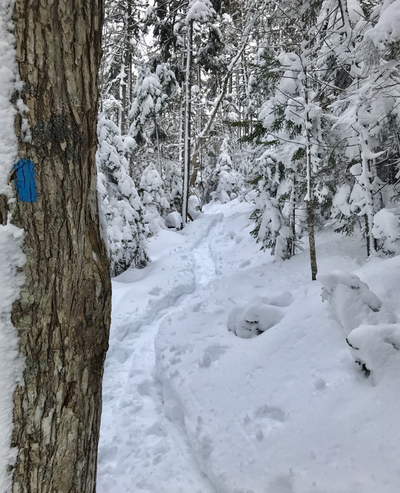 Hard to go around in the woods and very slick. 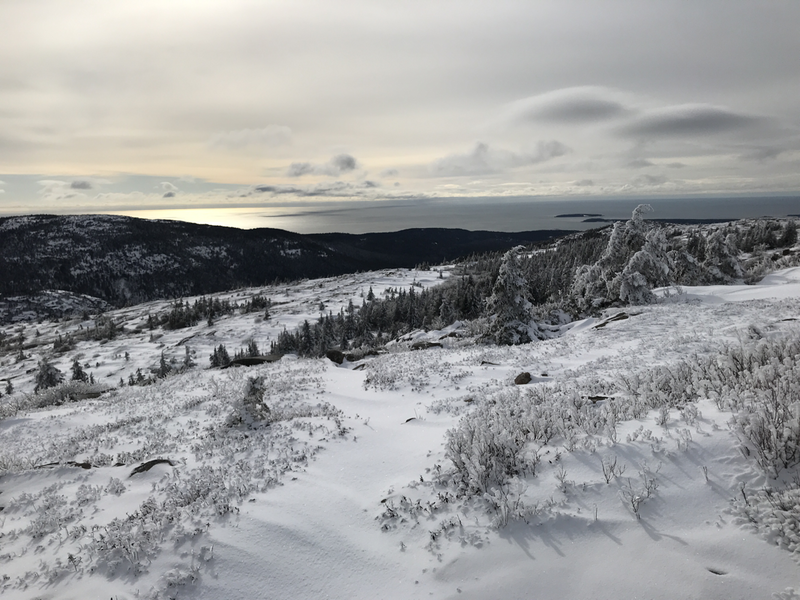 The summit of Cadillac is clear and the entire road down has been clear for a week. Crisp and clear morning in Acadia starting out the morning at 15 degrees F. Following several days of rain and mid to upper 30's the snow had cleared out in many sections but the quick overnight freeze put everything back in a hard cover of ice. The carriage roads around the Parkman Trailhead are mostly ice and all the bridge crossings are pure ice. Yaktraks are useful, but microspikes and screw shoes are definitely the best choice. 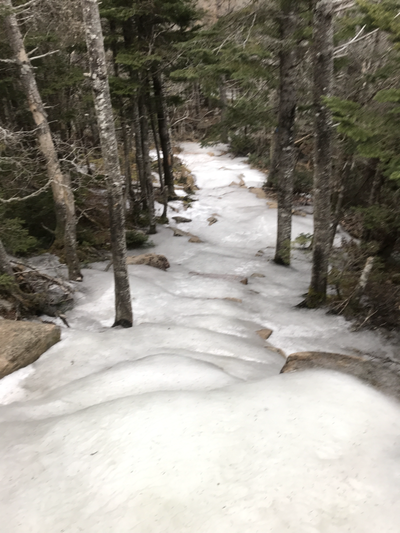 Hadlock Brook trail from the upper carriage road is extremely icy when you get to the stair steps. 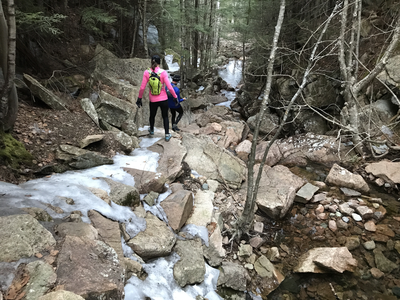 They are completely covered in sheets of ice and even going around them into the bushes is challenging. 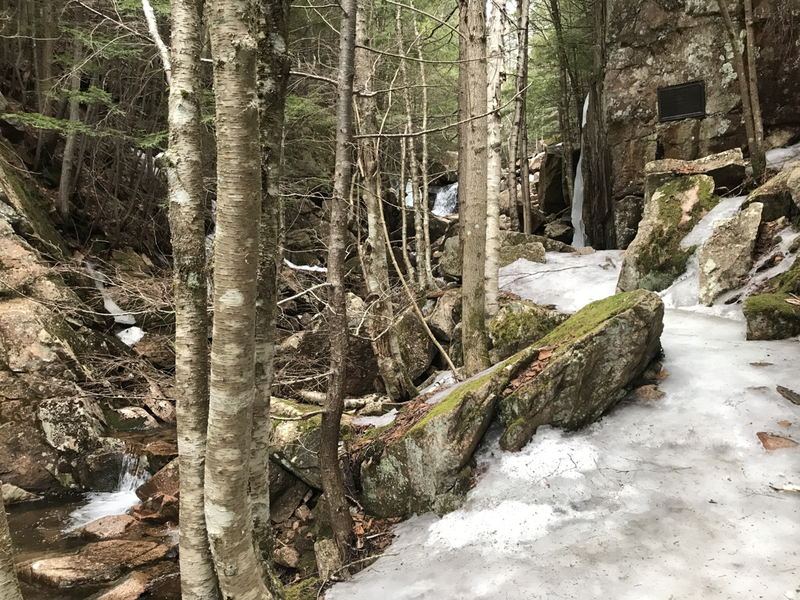 The upper section where it meets up with Sargent is a huge ice waterfall that requires a trip through the woods to route around it. The upper Sargent treeline area is easy running/hiking with patches of ice and snow but generally passable without any issues. 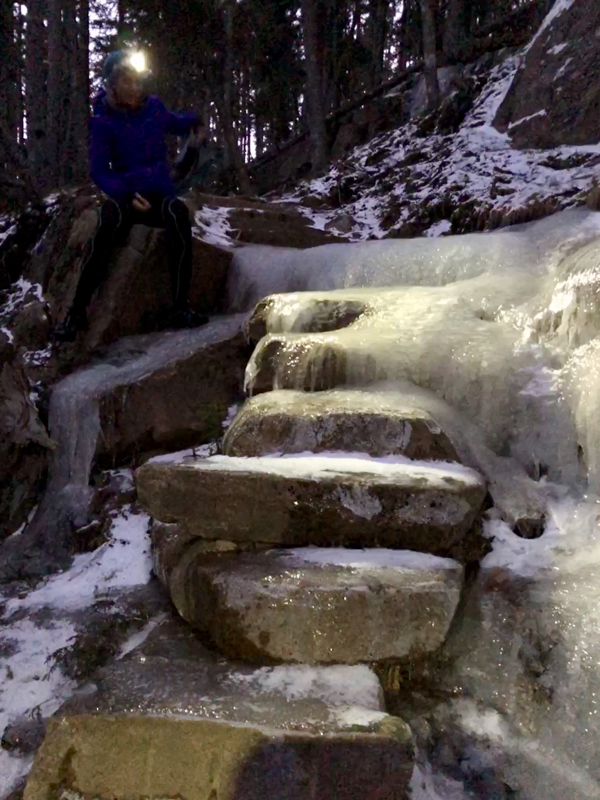 Descending down Sargent and Amphitheater is sketchy at best, again with microspikes it may be slightly better. It's just a massive sheet of ice in huge sections and one slip will send you down into a tree trunk. 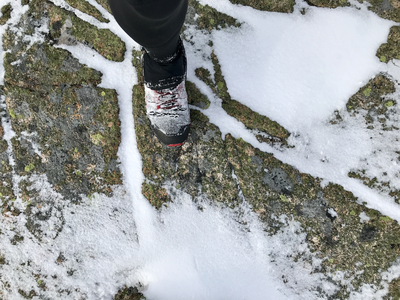 The snow is a hard pack that allows you to stay on top with just shoes, so finding snow means easy running or hiking. 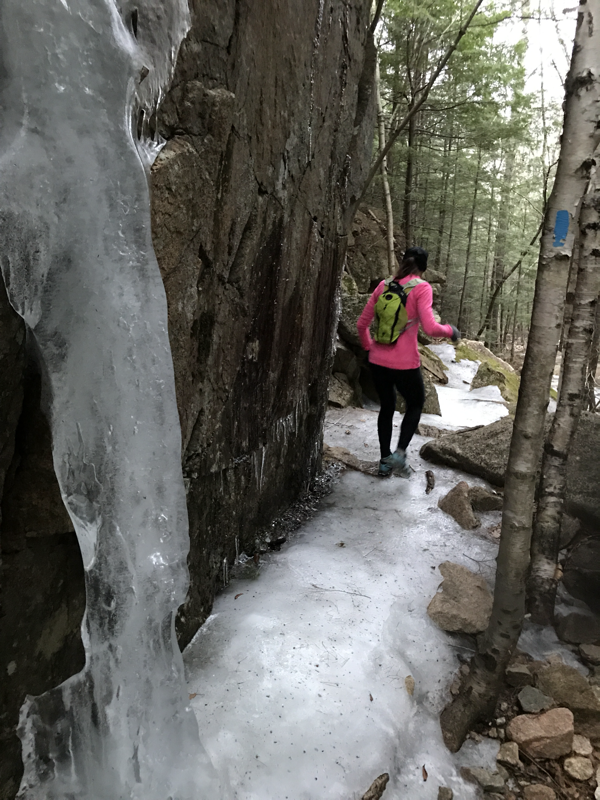 The steeper the trail you choose, the higher likelihood you will find walls of ice.